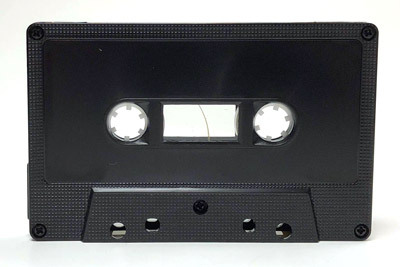 Cassettes with the record tabs in can be recorded on any cassette recorder. Magnetic oxide leader tape is used for instant-start recording applications. 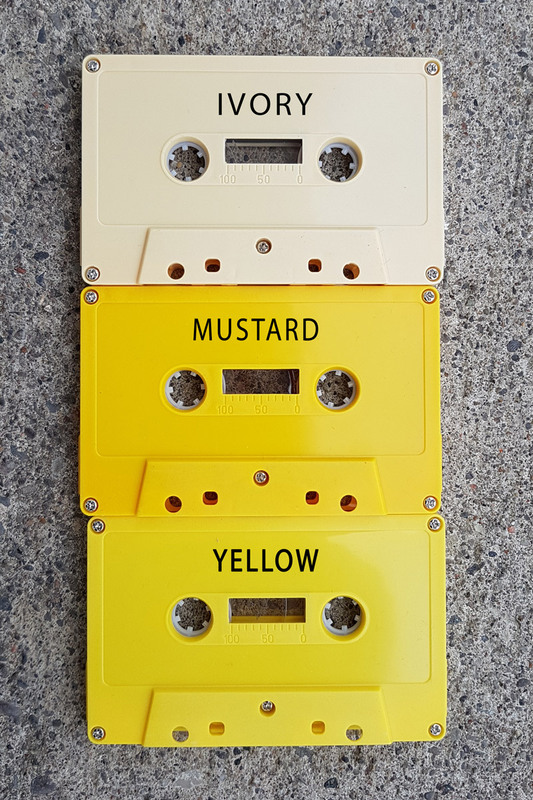 don't want to miss a word. 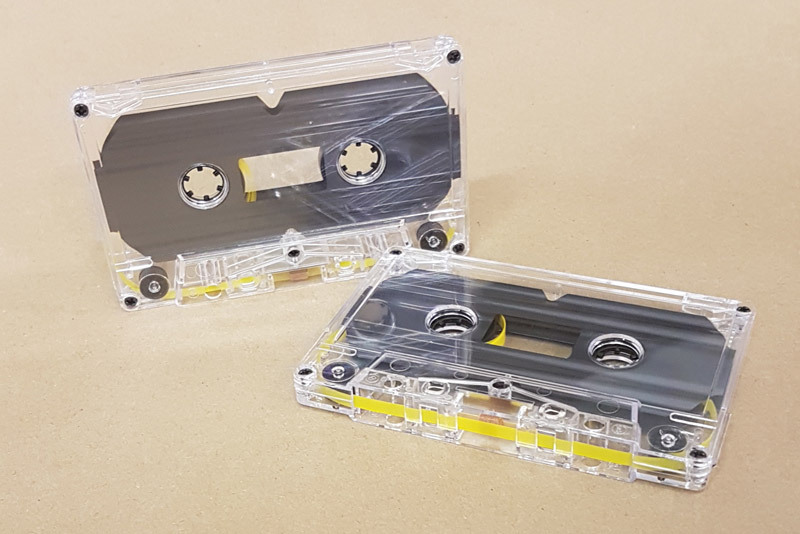 Clear with Atari-yellow leaders back in stock! 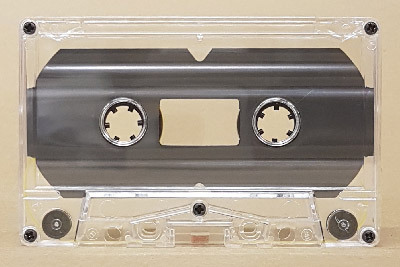 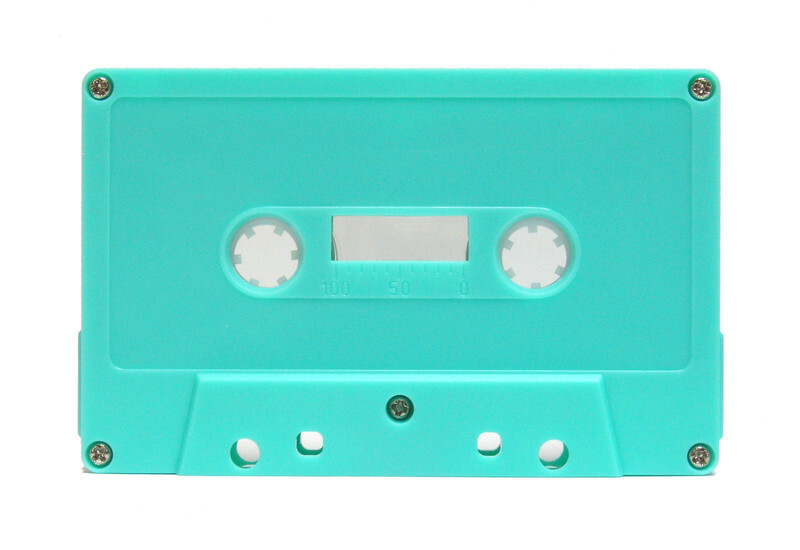 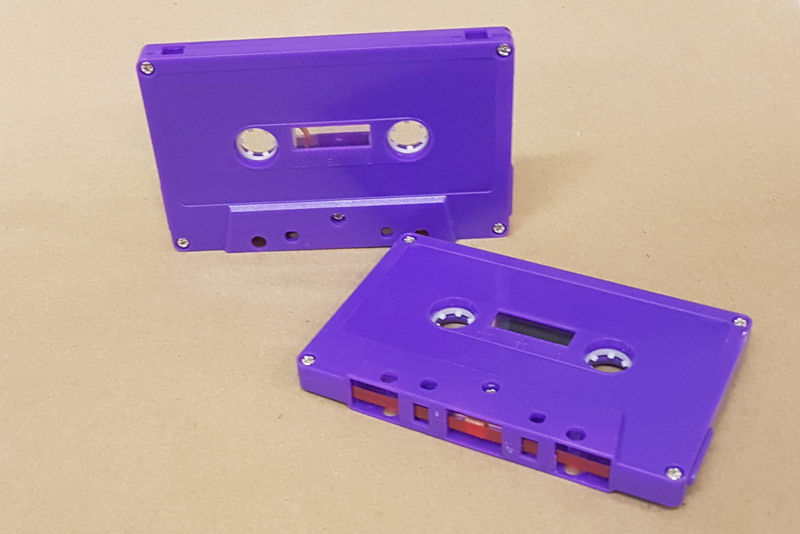 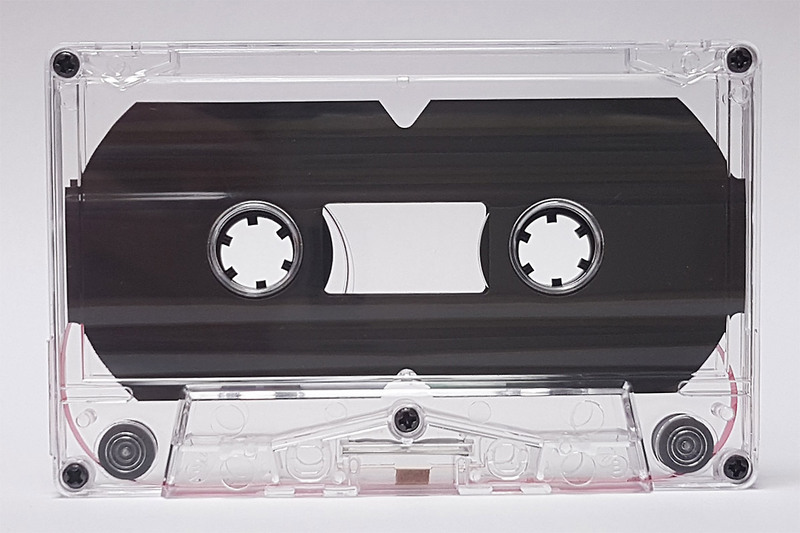 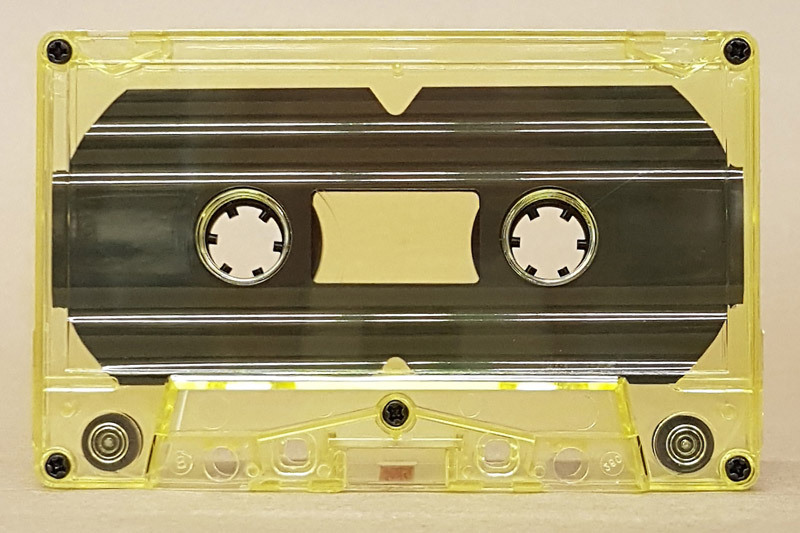 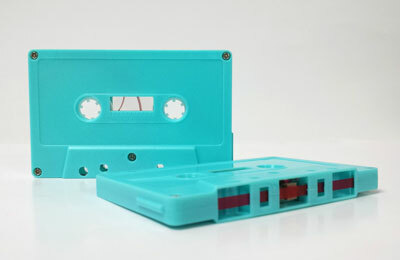 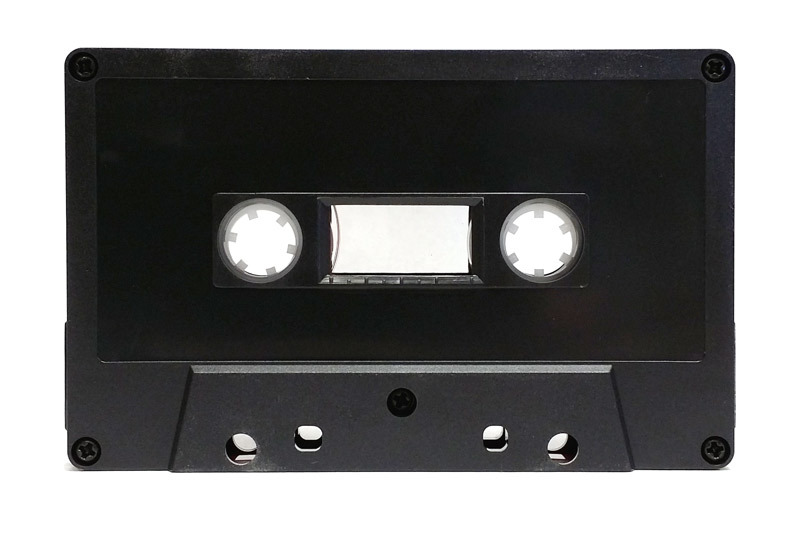 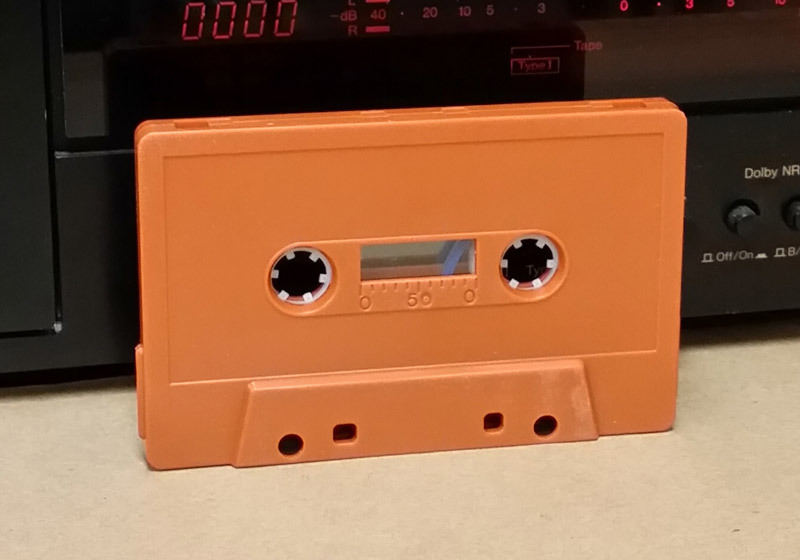 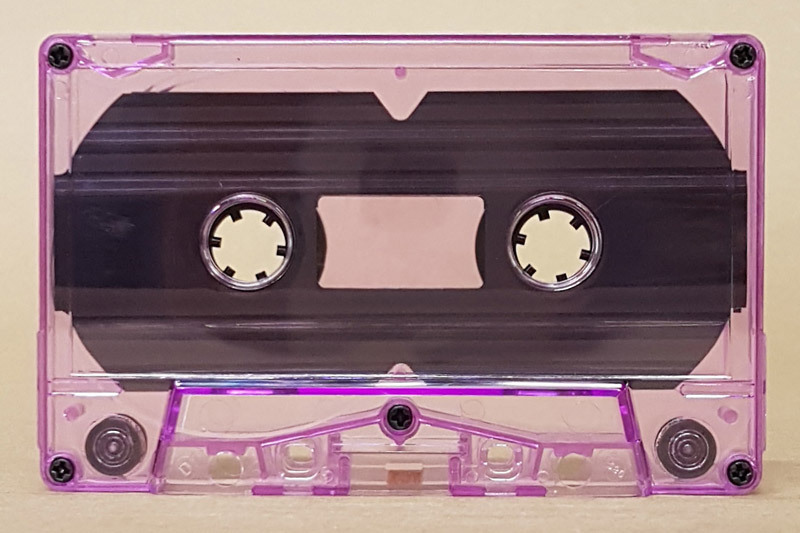 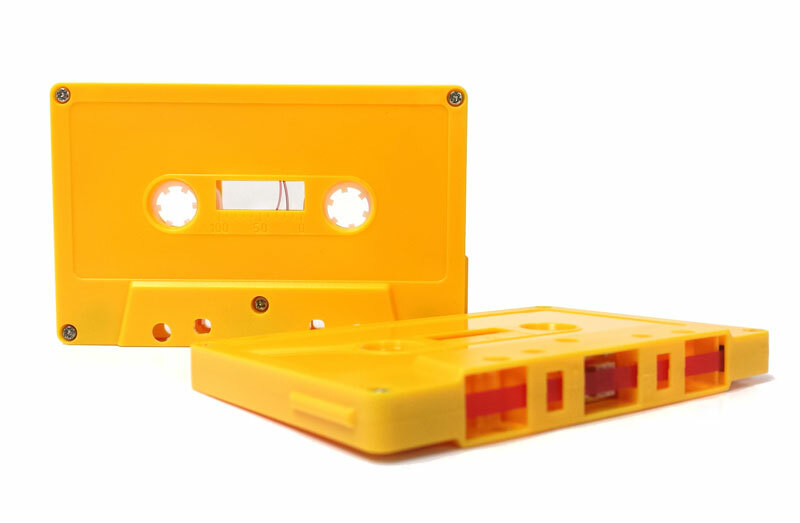 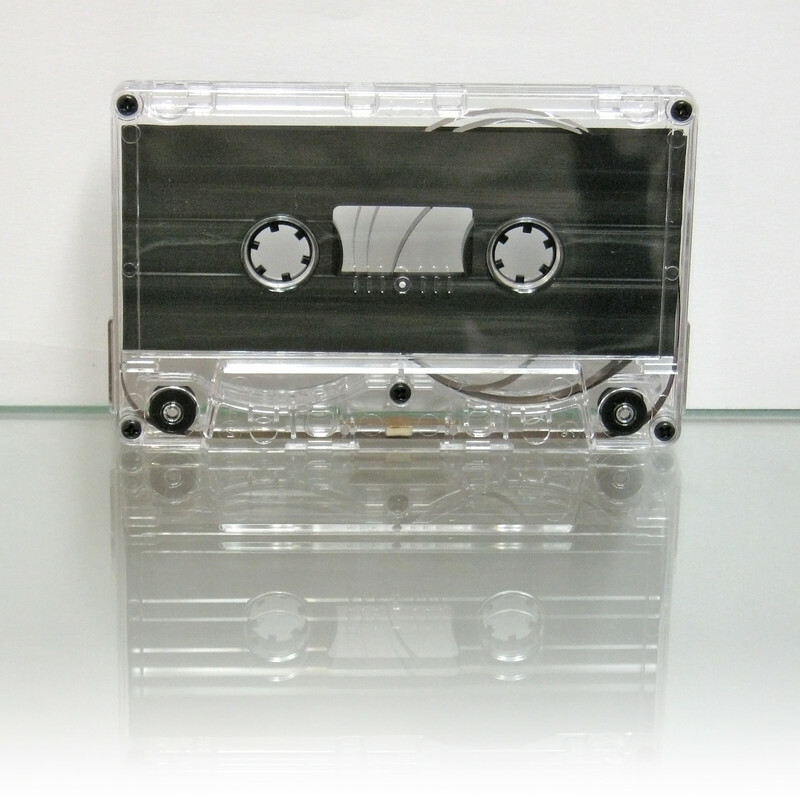 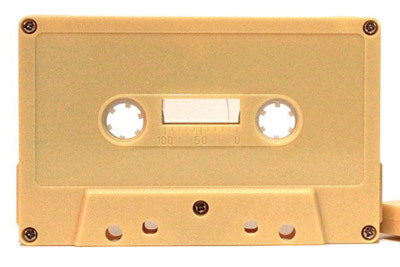 Top quality cassette shells with independent bridge piece for higher resolution recordings. Chrome notch, tabs out. 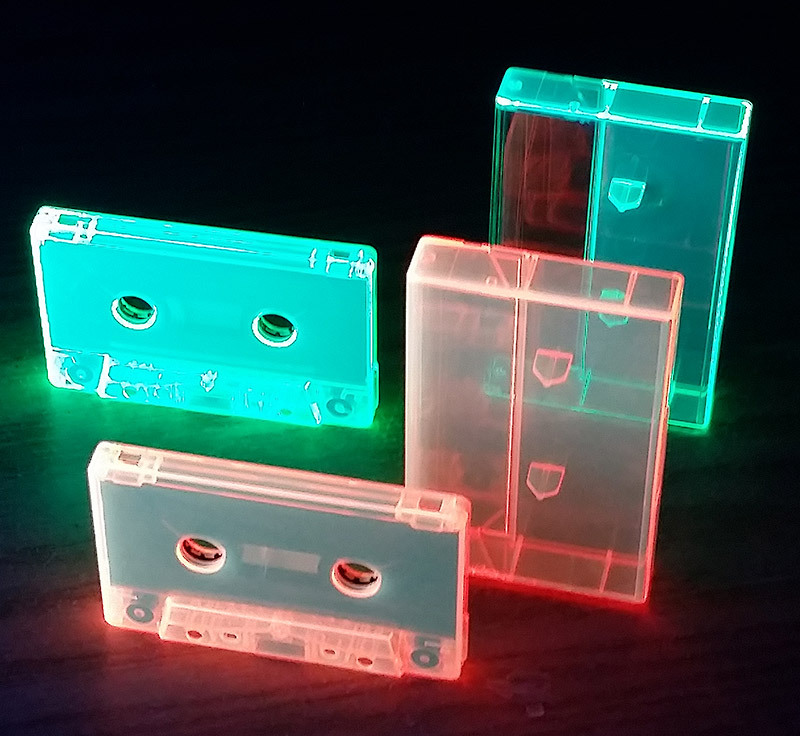 Restocked. 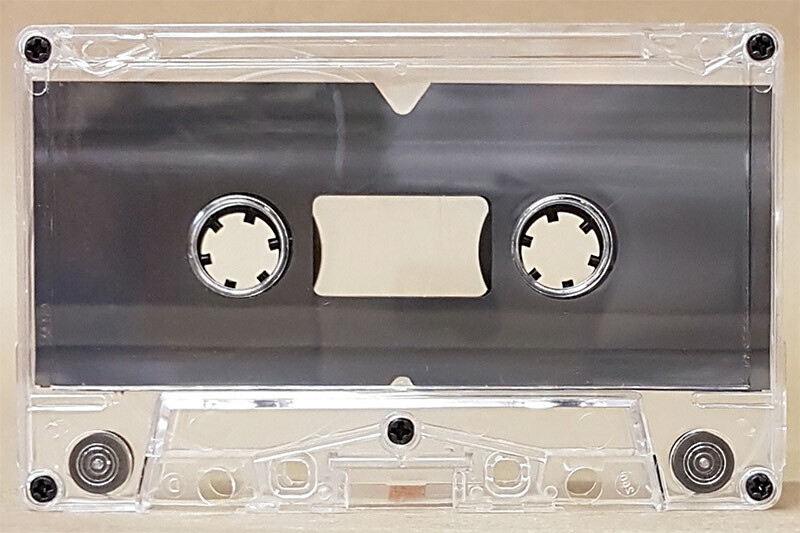 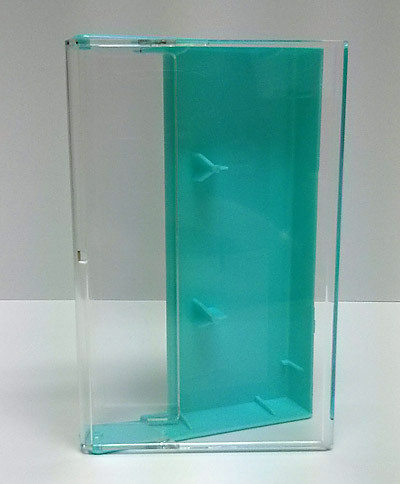 This is a high-precision cassette shell for high-bias (Type-II, chrome, cobalt) tapes. It has a chrome notch on the top of the cassette so all auto-sensing cassette decks will record with the correct bias and play back with 70 µS equalisation. 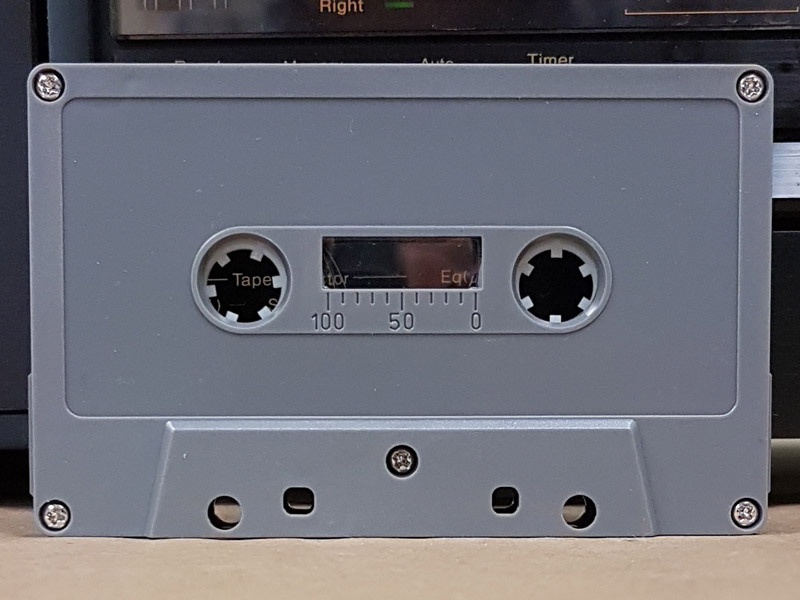 Tabs out, sonic weld (no screws), normal notch/120 microsecond EQ. 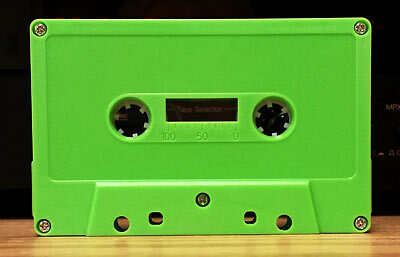 It's proving impossible to get accurate greens with our current camera setup. 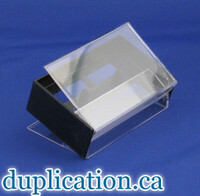 Here are some comparison photos for relative comparisons. 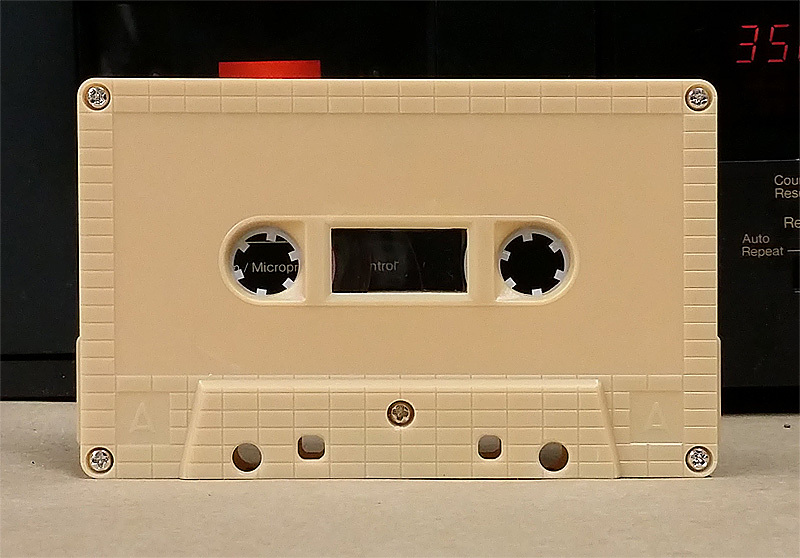 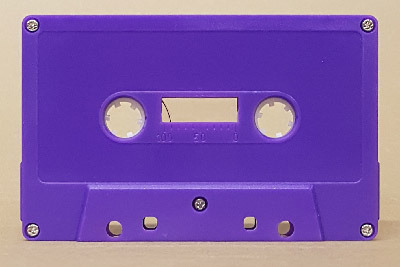 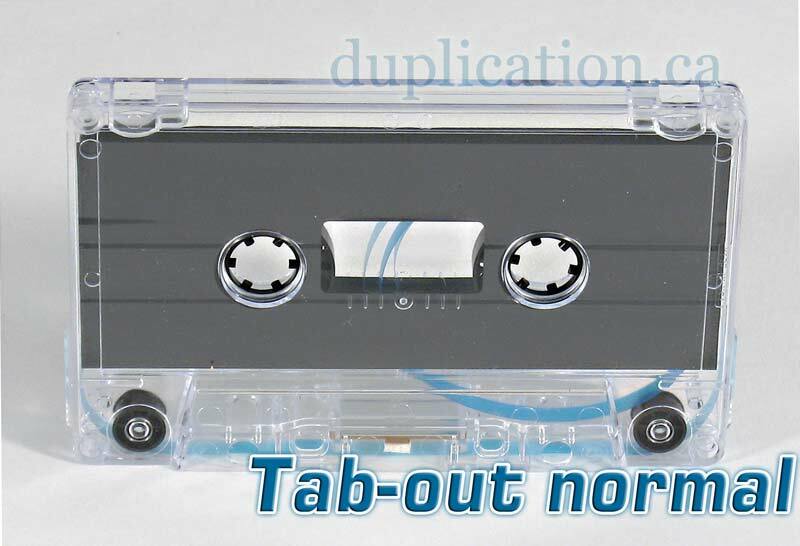 This cassette has no borders so you might want to try edge-to-edge printing. 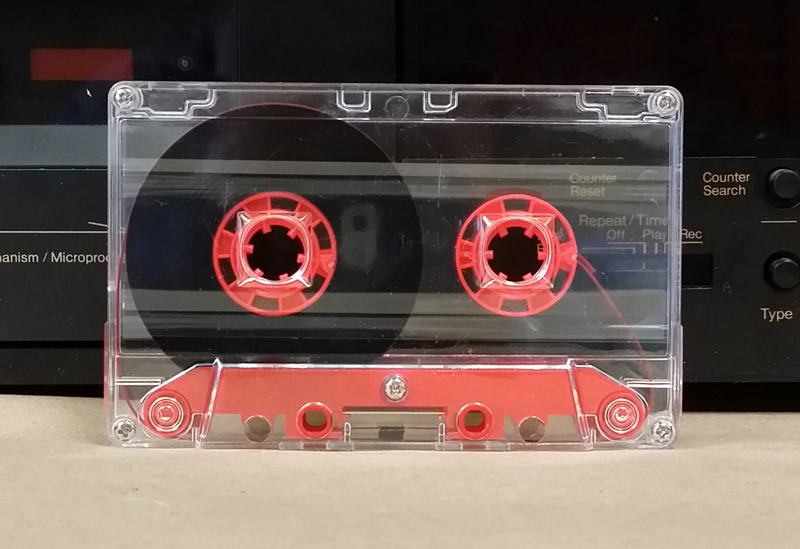 Flat surface without raised borders around the edges, no screws, red leaders, soft windows, tabs out. 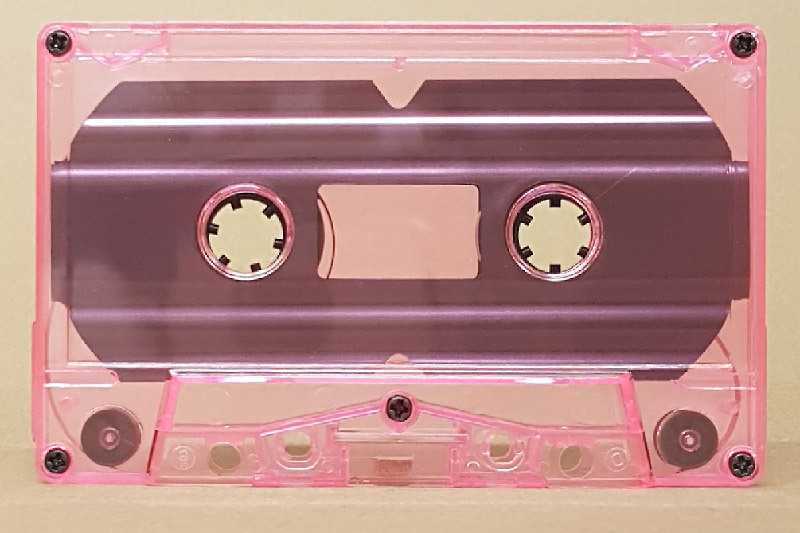 This is just about the most beautiful cassette ever! 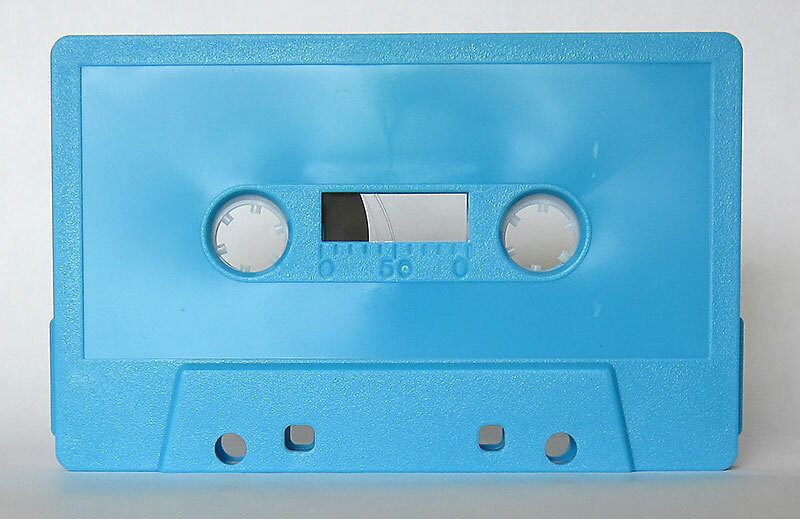 Also consider the azure blue and butterscotch camel cassettes below. 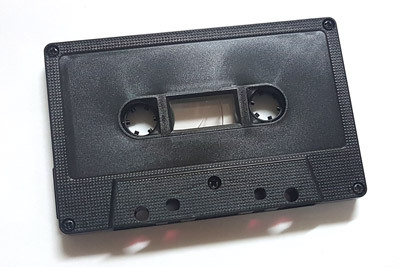 These matte black cassettes have a great distressed surface. 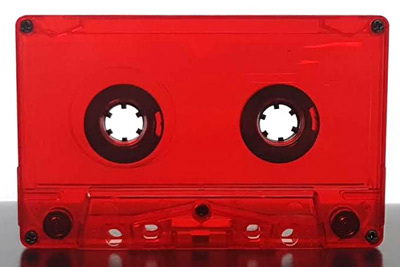 Black, tabs out, normal bias, red leaders, with ridged pattern. 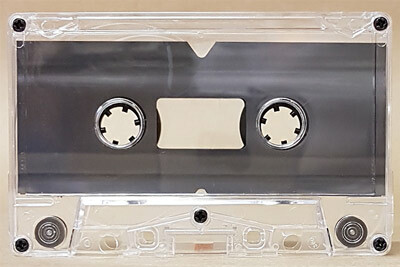 Standard paper labels do not fit on this cassette. 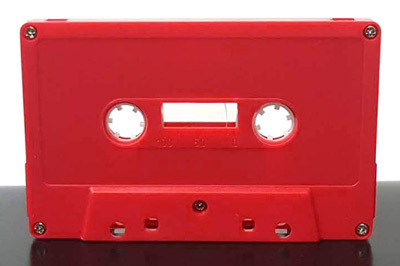 Black, tabs out, normal bias, red leaders, with SQUARE window. Standard paper labels do not fit on this cassette. 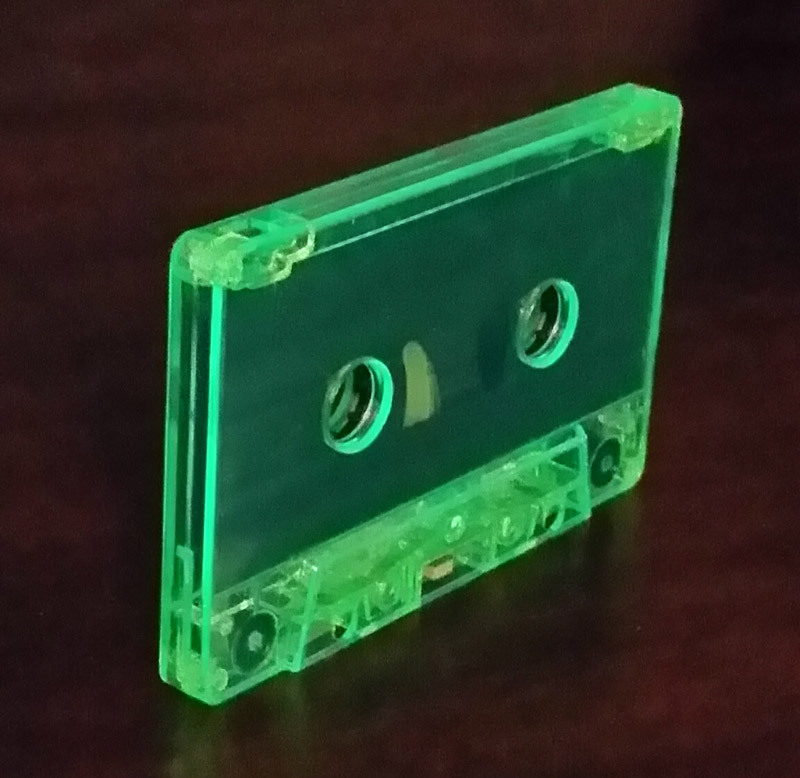 Brighter than our campfire cassette, and it fluoresces under black light. 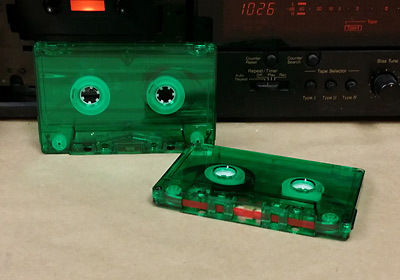 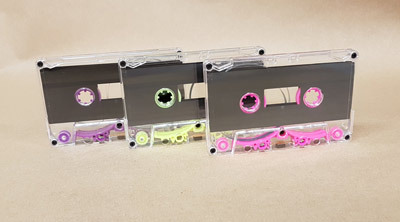 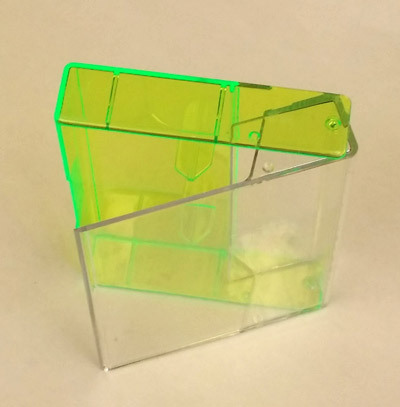 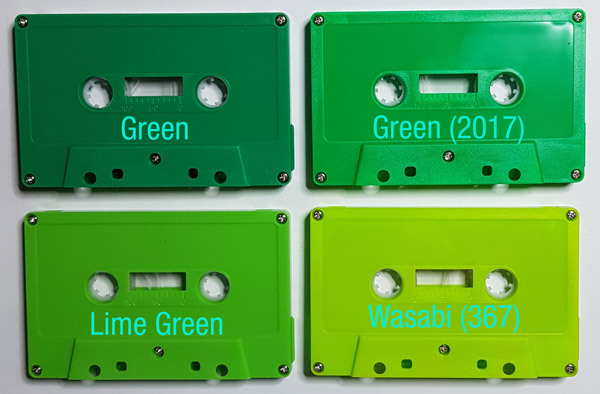 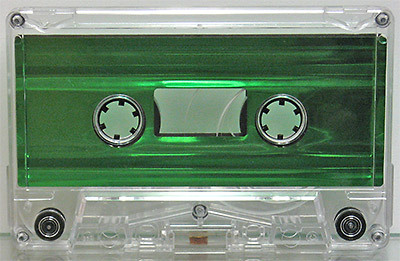 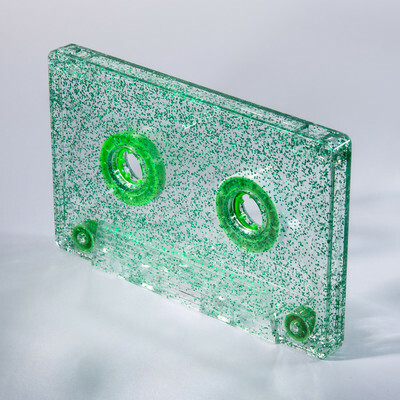 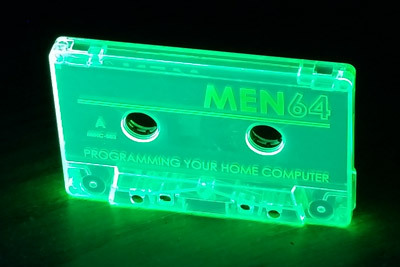 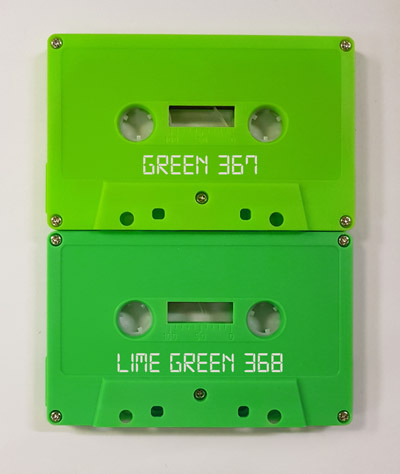 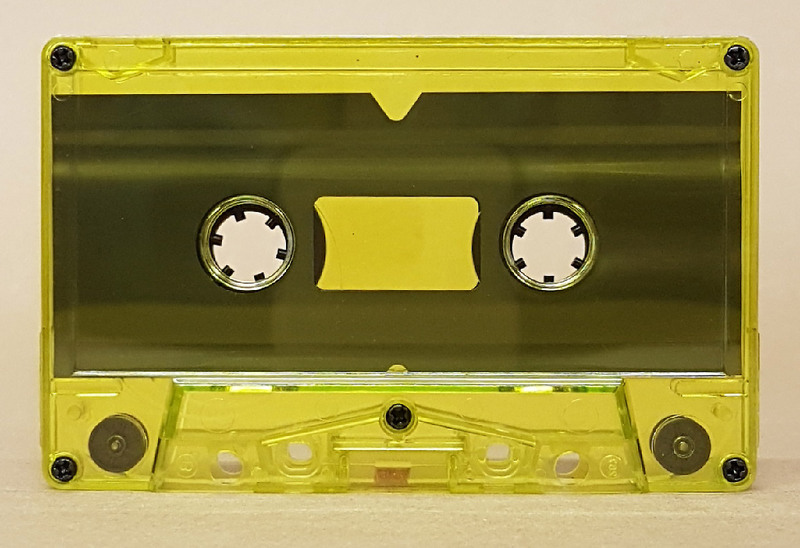 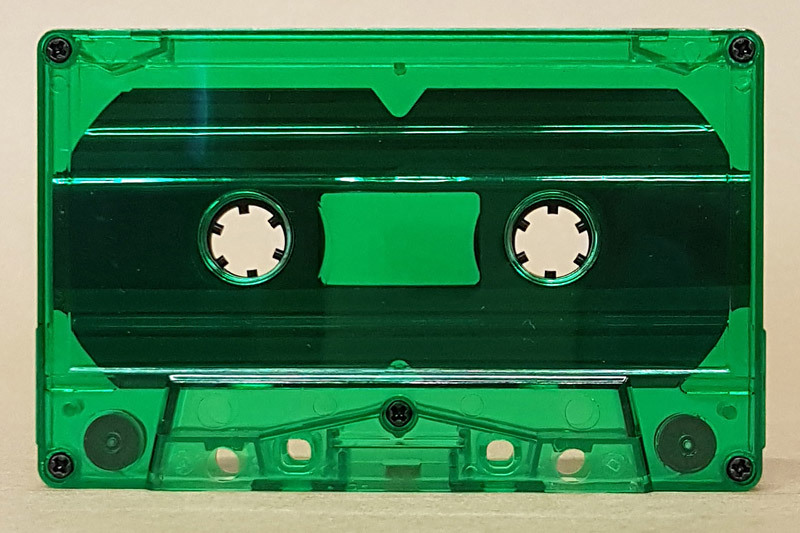 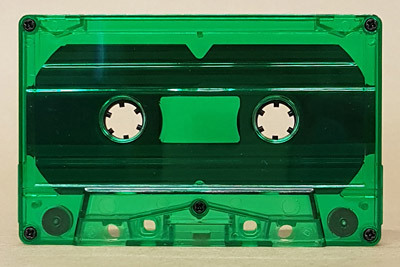 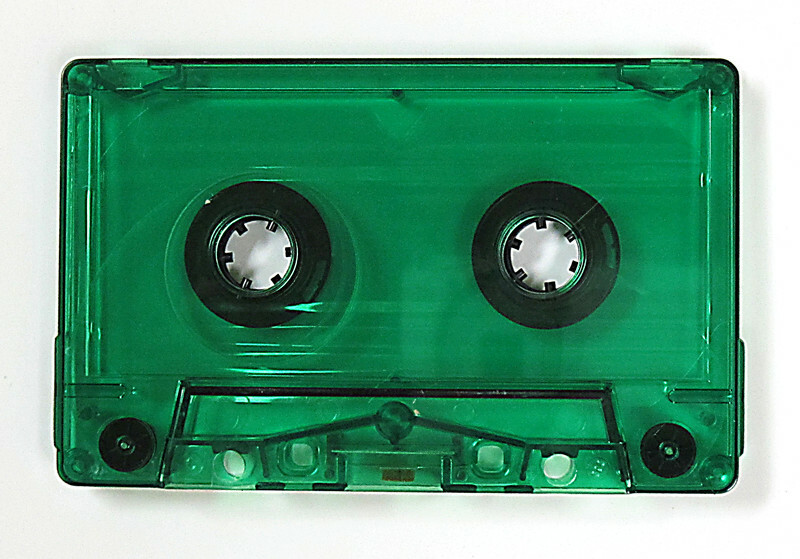 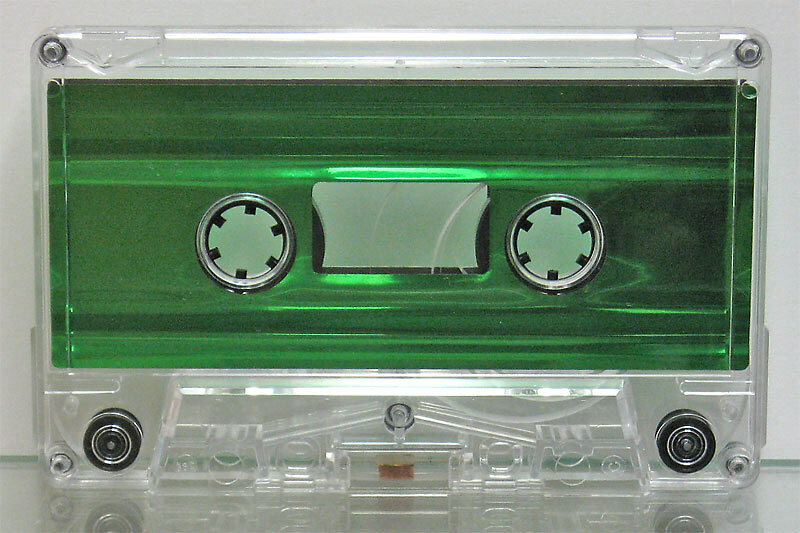 Back by popular demand: green and pink transparent cassettes, now with popping red leaders! 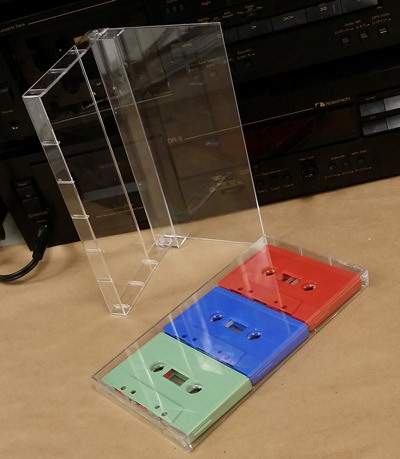 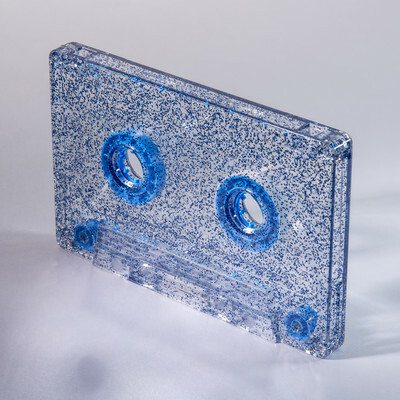 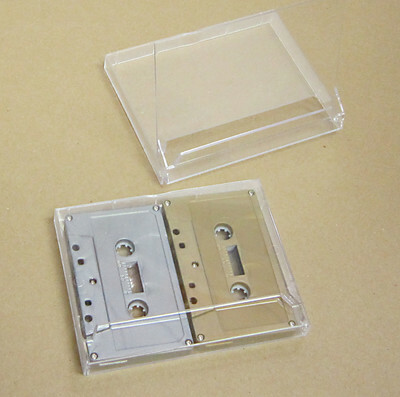 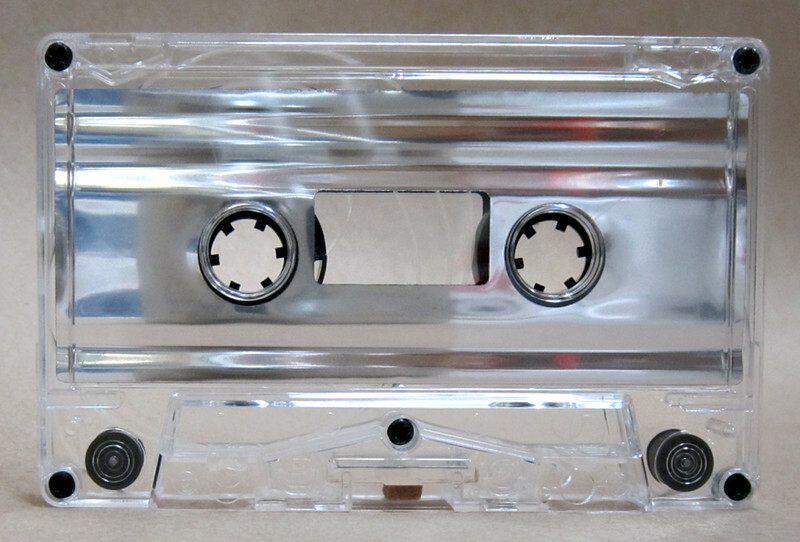 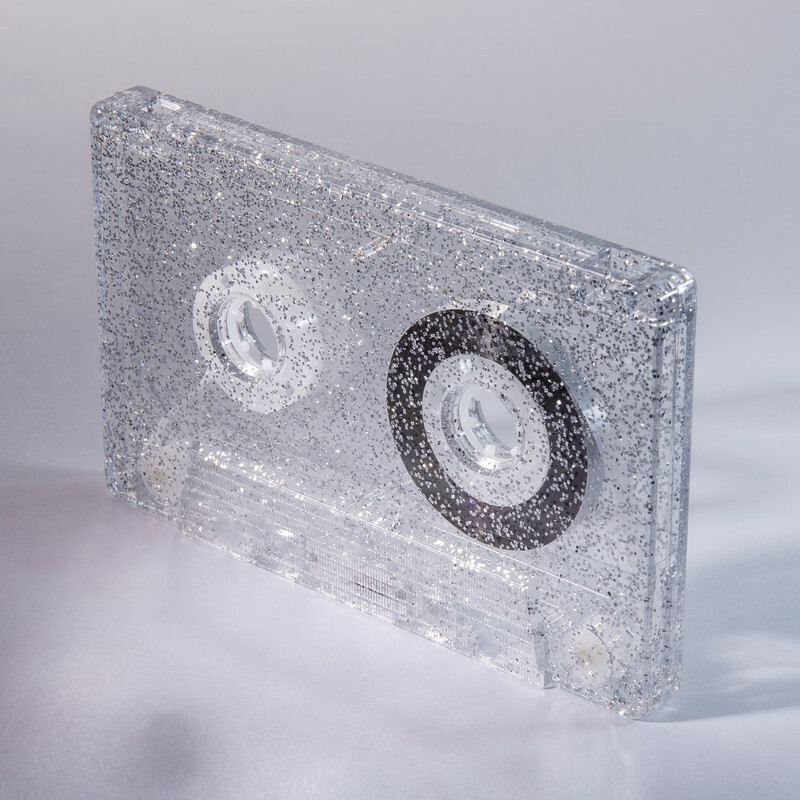 These are transparent and have NO SCREWS, ideal for prison tapes. The record tabs are IN for recording on any cassette deck. 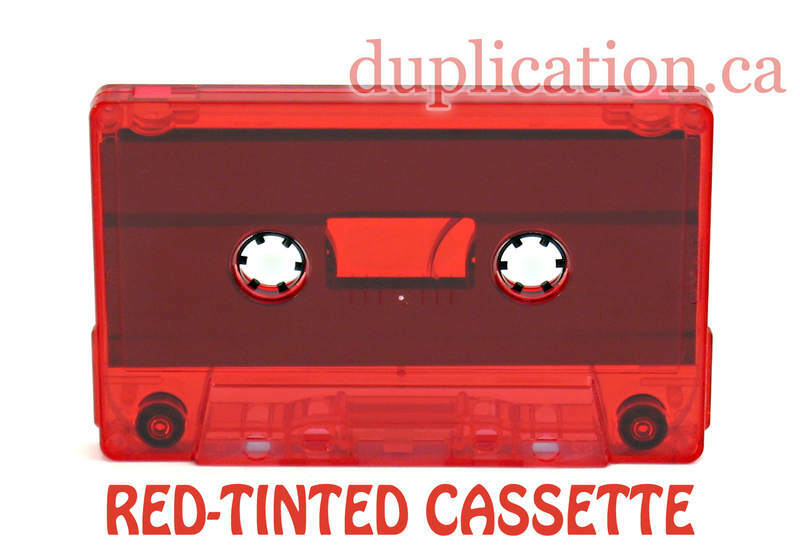 For music duplication projects we pop (remove) the record tabs so there's a small extra labour charge built into our duplication calculator. 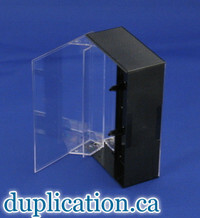 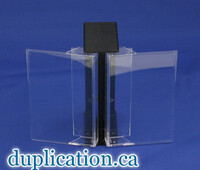 Since there are no tabs these are ideal for duplication orders because we don't have to take time to remove the tabs. 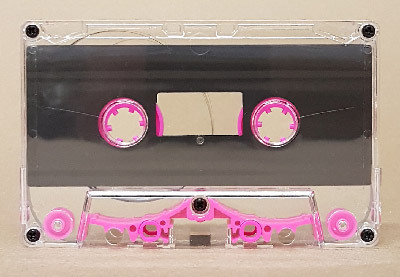 Back in stock. 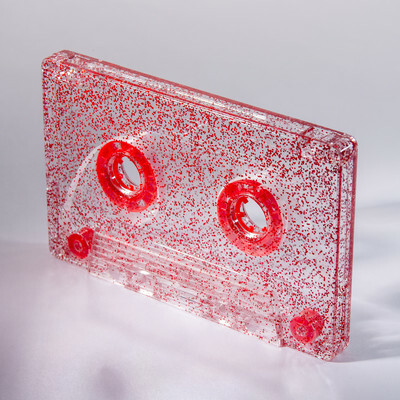 We also have a new version with the record tabs in and red leaders..
We've made more glitter tapes! 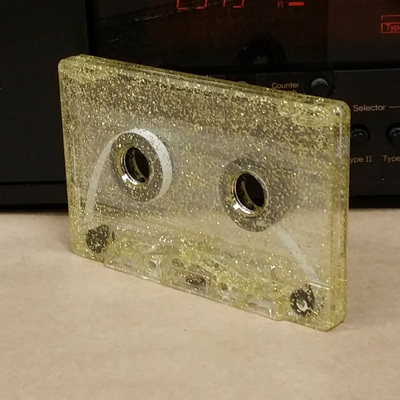 The glitter is embedded inside the plastic so it will never scratch off. 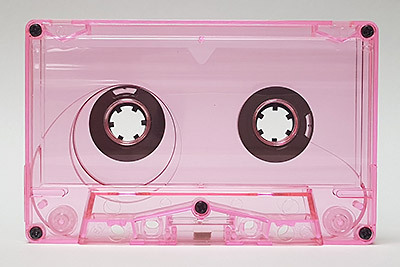 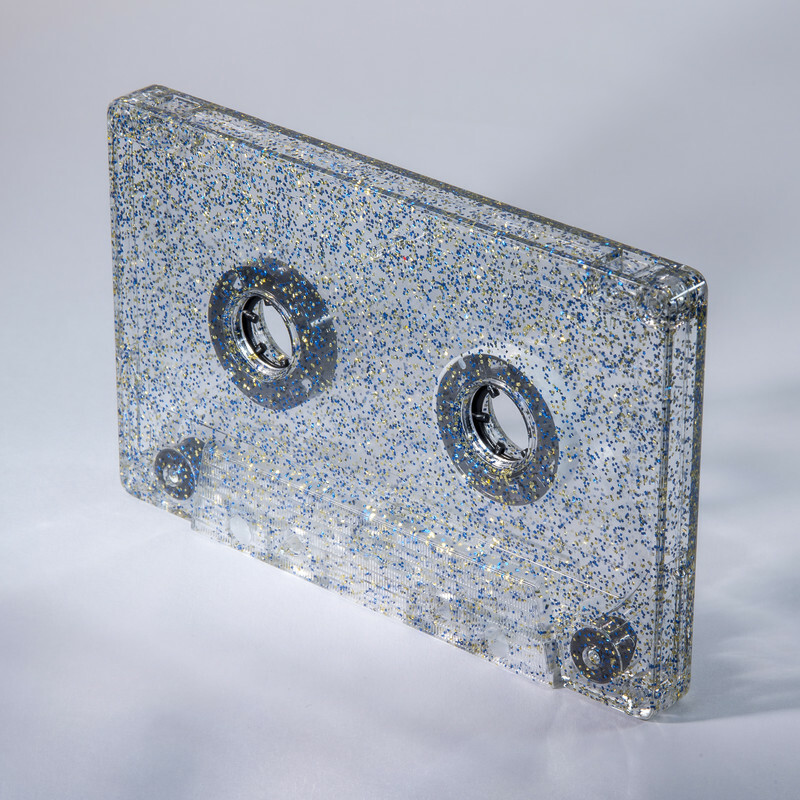 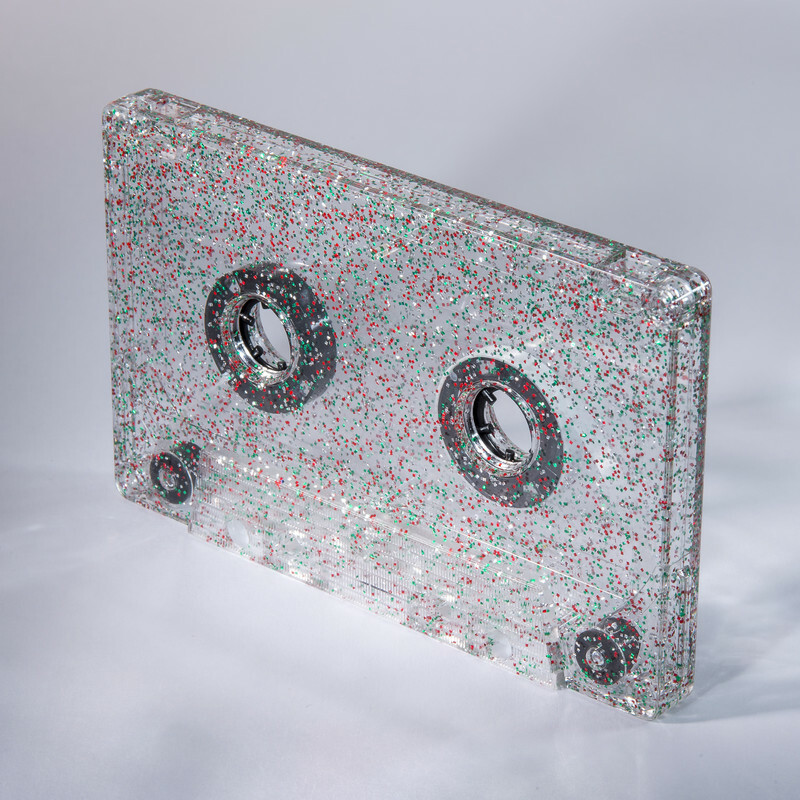 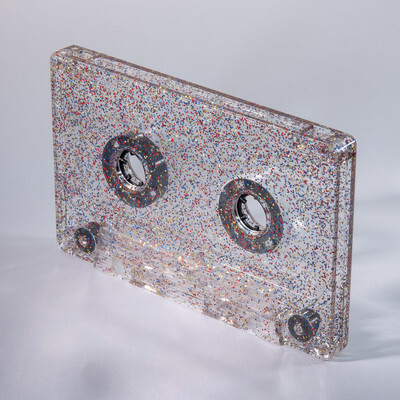 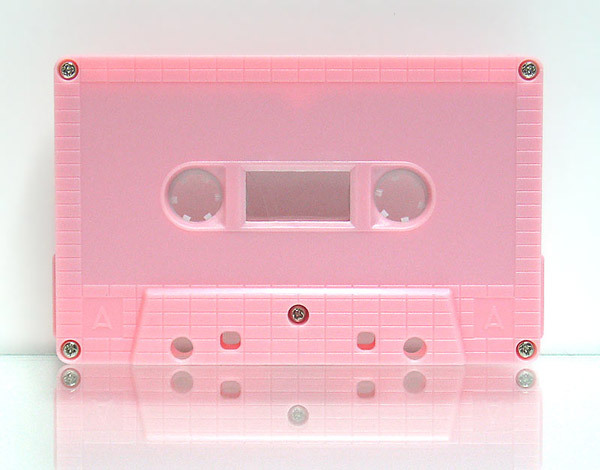 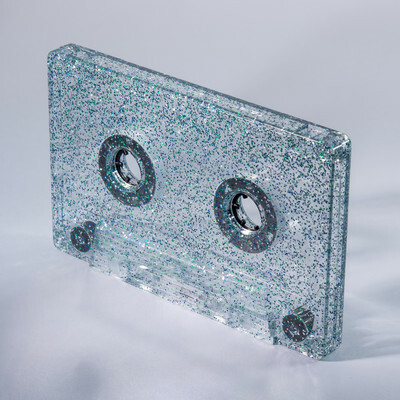 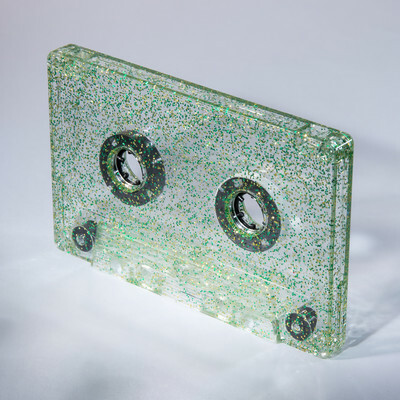 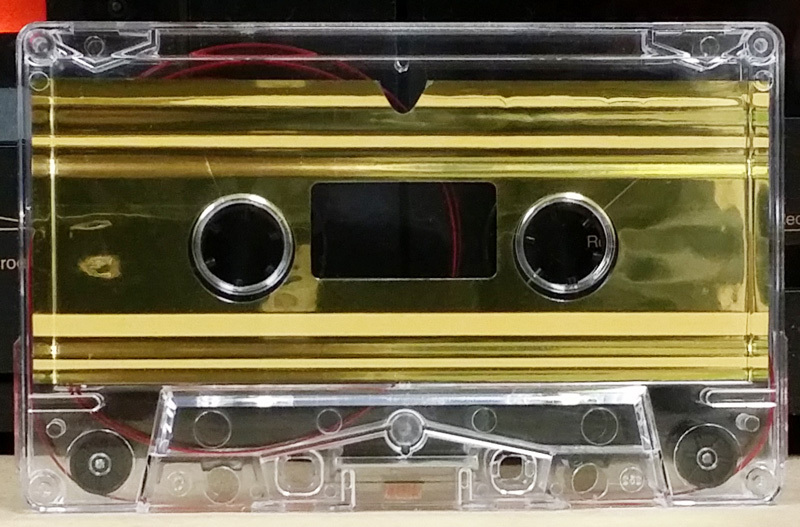 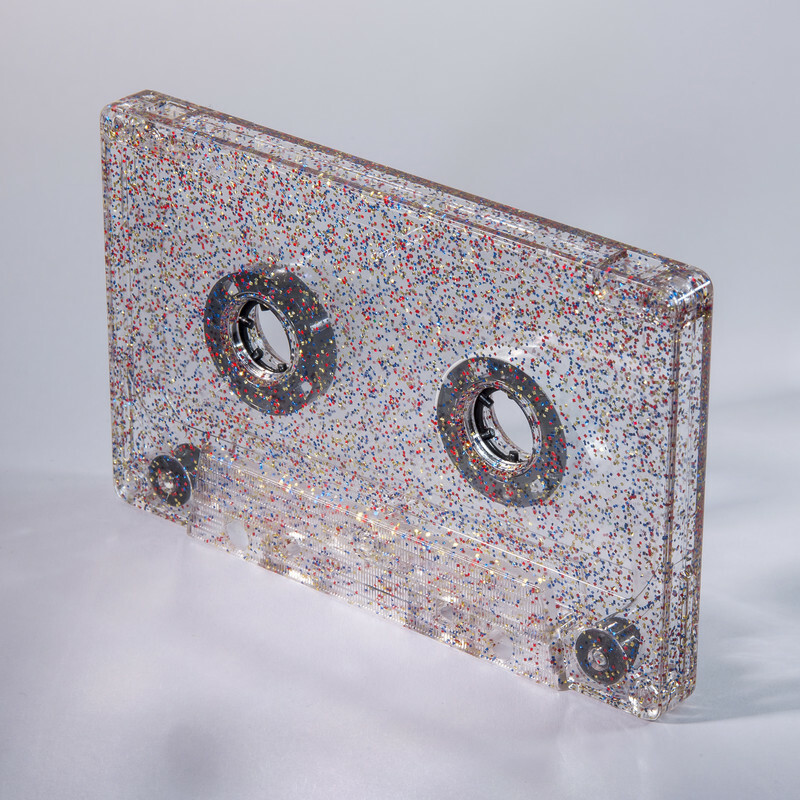 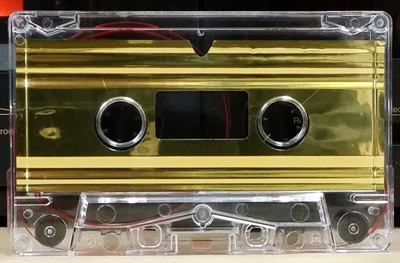 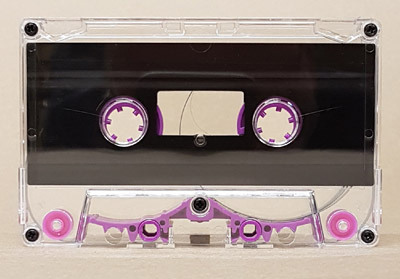 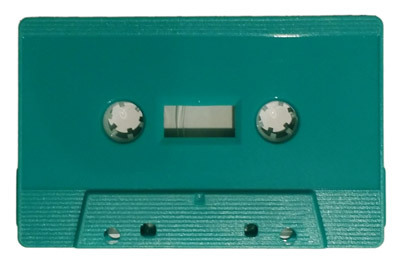 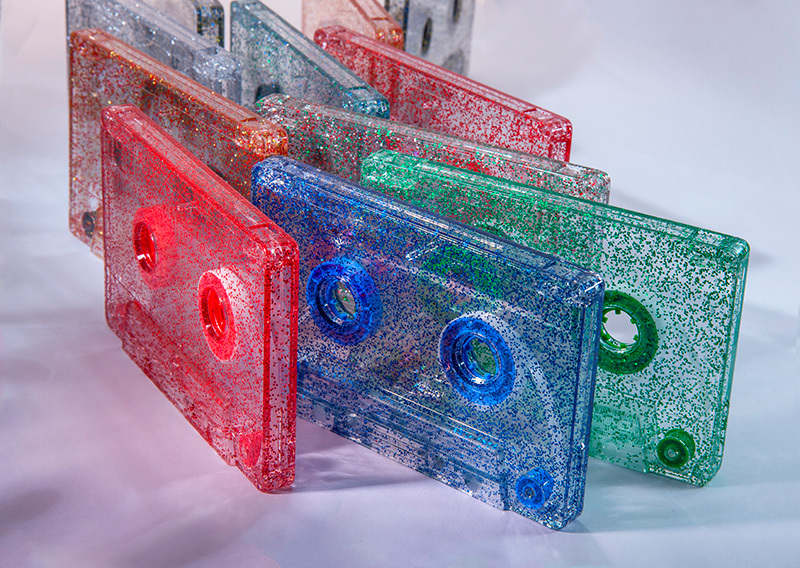 All glitter cassettes come with the record tabs in, and are sonic welded (no screws). 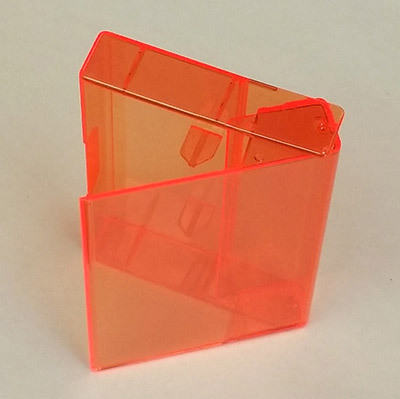 Dimensions: 4" x 4.25" x 0.625"
J-Card dimensions (approx): Front: 7.75" x 4", spine 0.5", flap 15/16"
This is the best choice for your tabs in tapes for home recording. 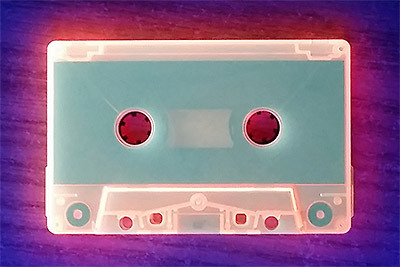 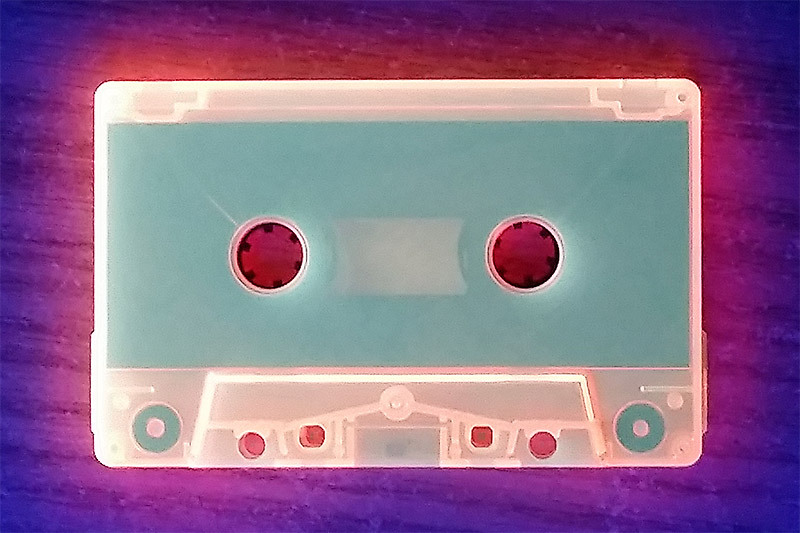 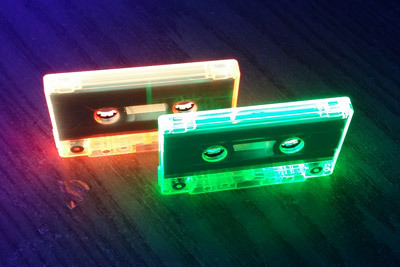 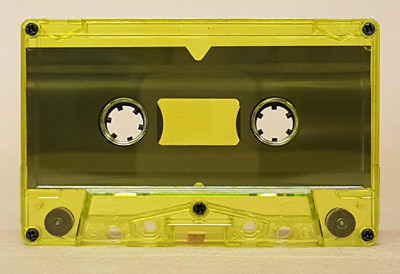 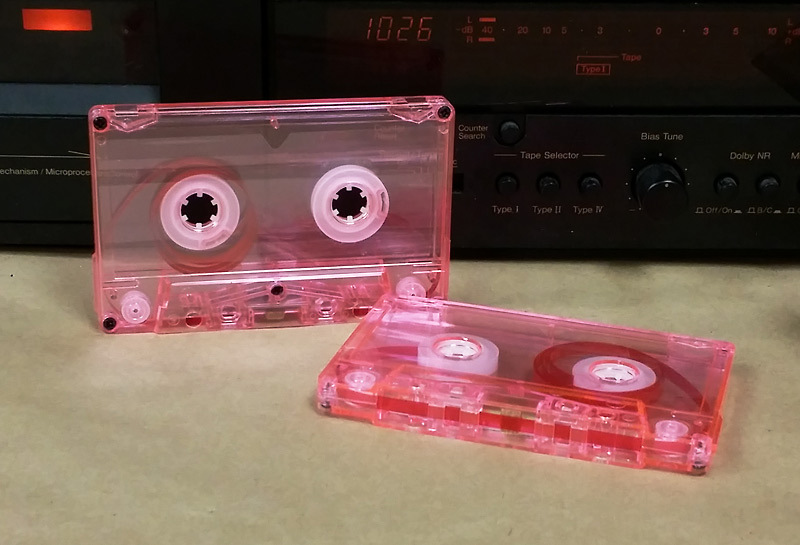 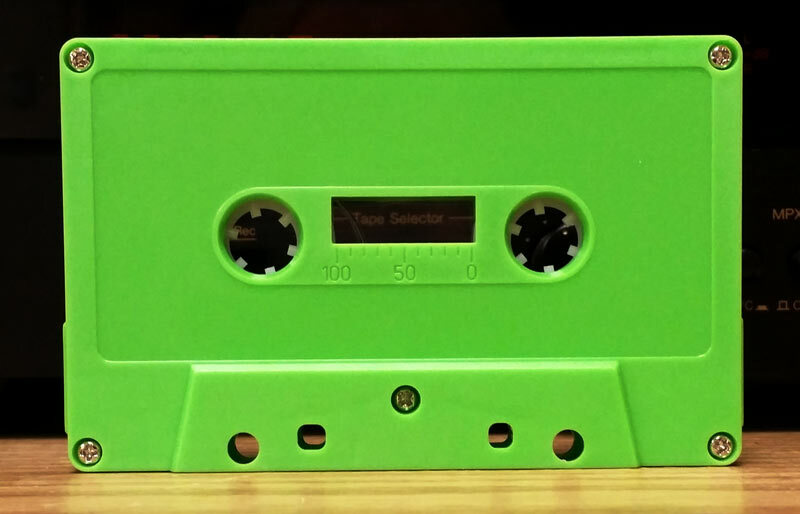 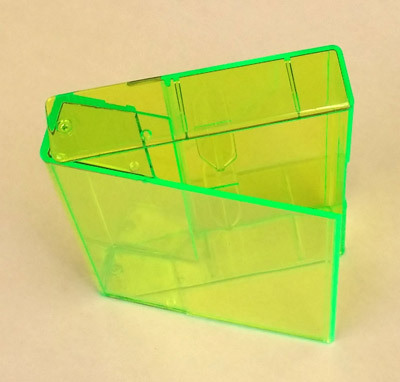 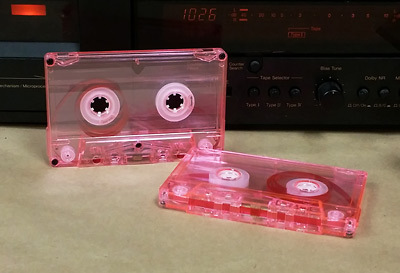 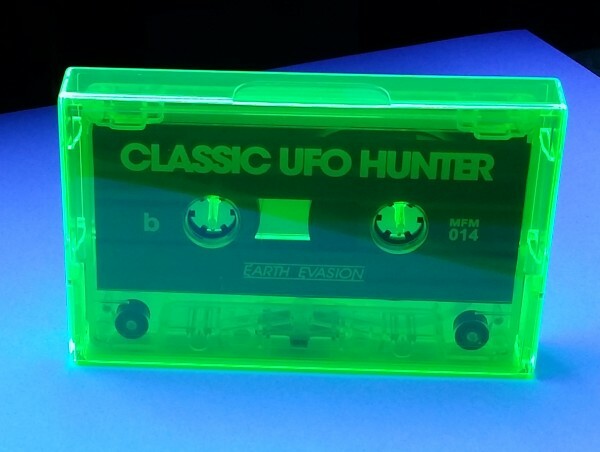 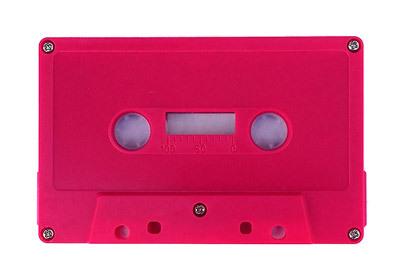 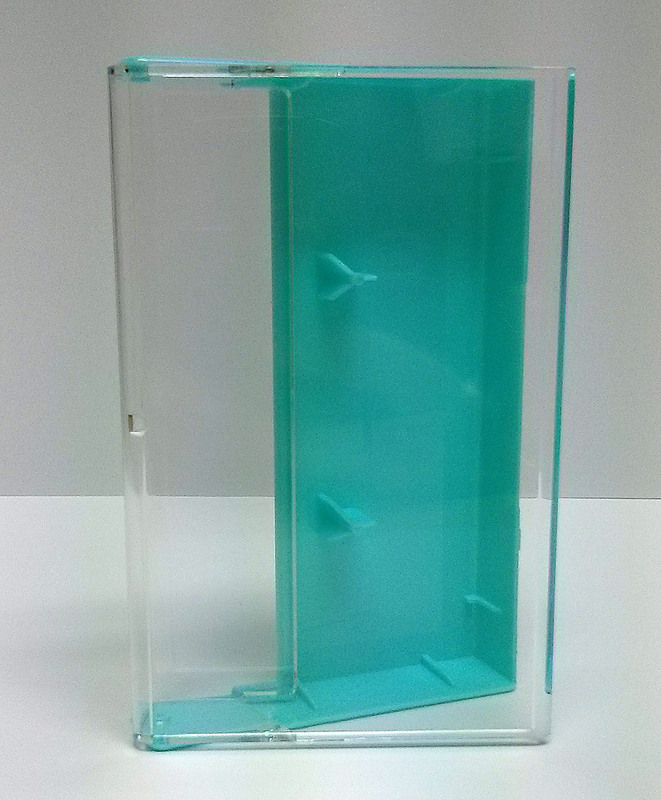 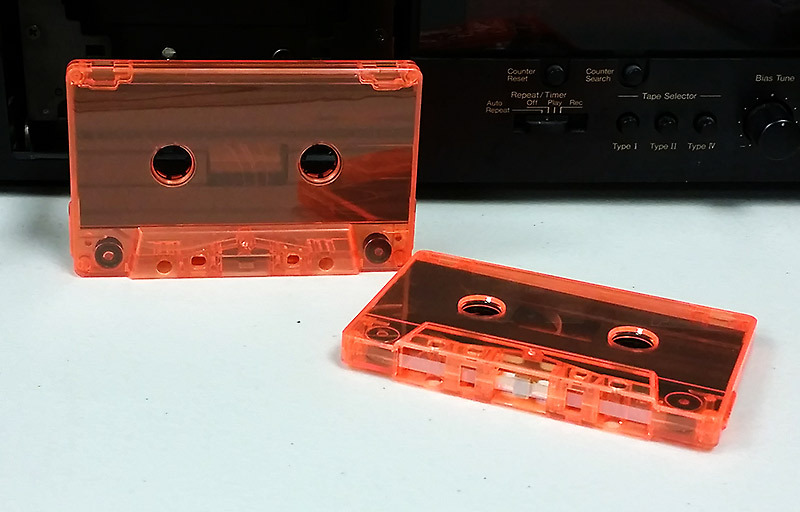 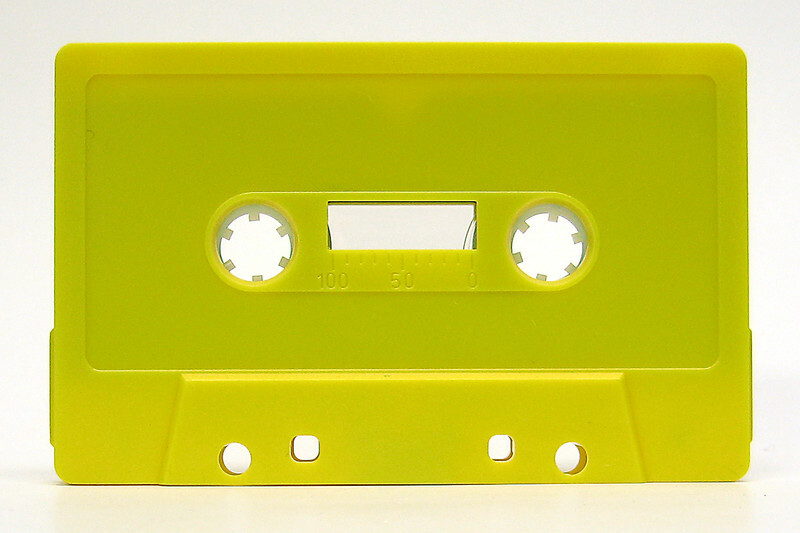 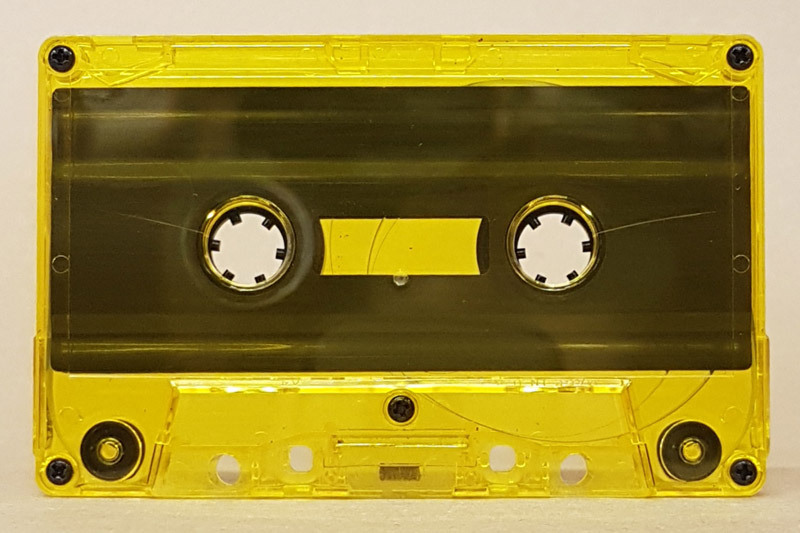 Check out these remarkable fluorescent cases and cassettes! 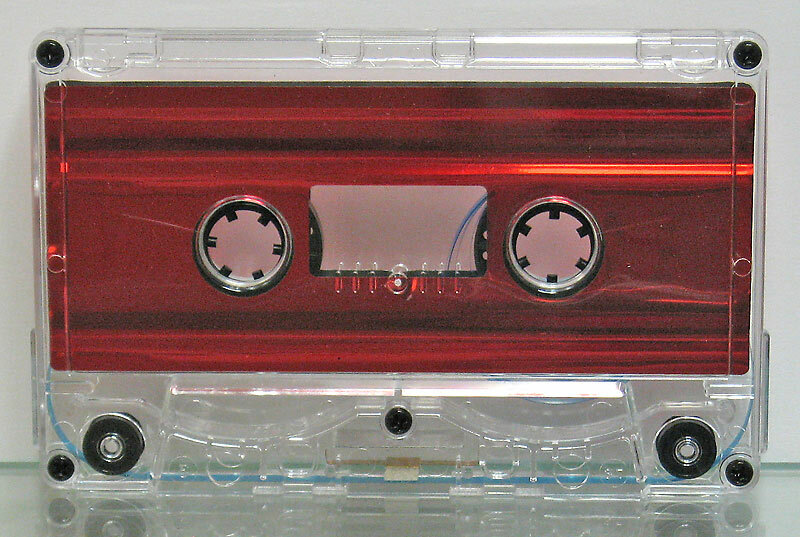 Many people put chrome or cobalt tape into normal shells. 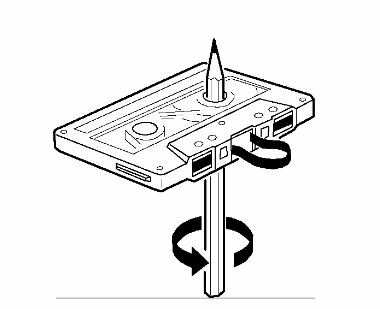 To do this you MUST have a cassette recorder with a BIAS Selector button. 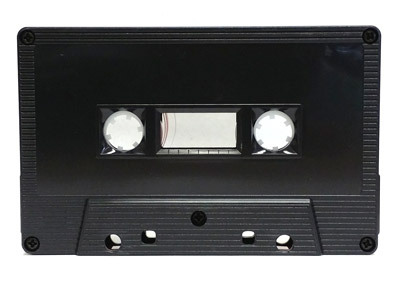 You will not be able to record correctly on later-model cassette decks which use an auto-sensing pin to determine the bias and EQ. 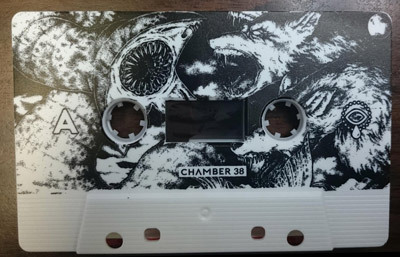 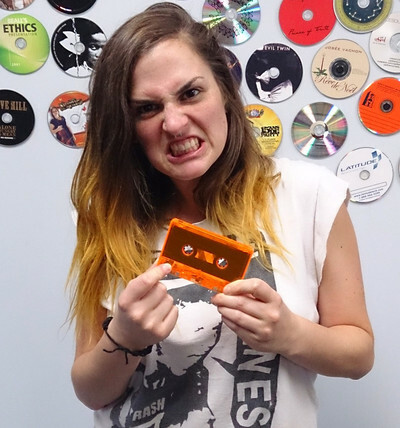 Contact us for a custom quote on your upcoming double-cassette release! 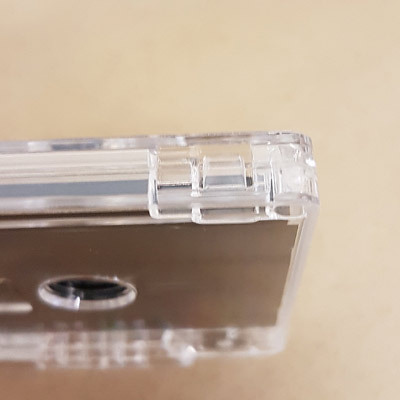 Our stock now has screws which are on random sides, 50/50. 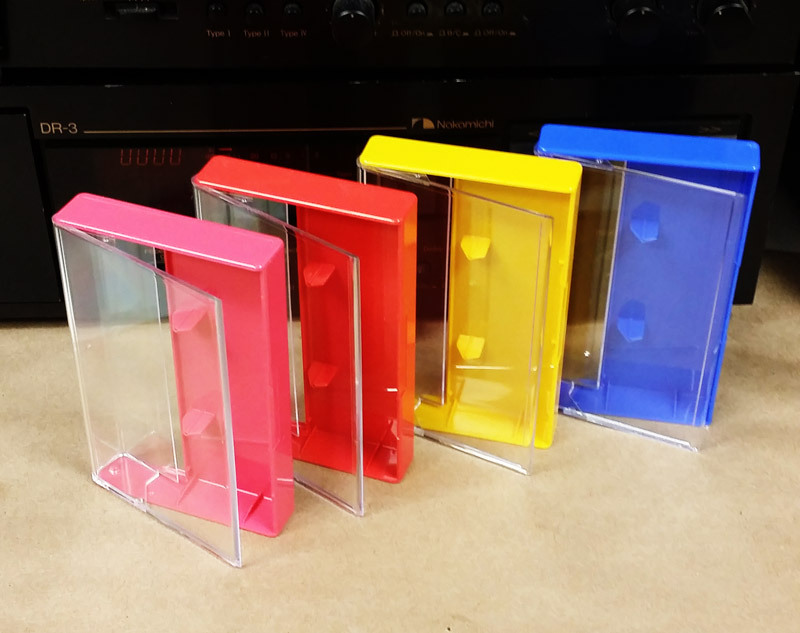 Manual sorting is available for 5 cents per piece. 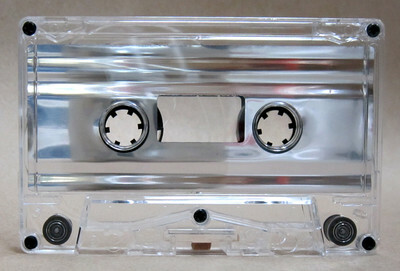 Clear cassette with grey liner, tabs in for home recording, normal bias, 5 screws. 70 microsecond EQ is used to reduce the playback hiss by 4.5 dB, but we also lose 4.5 dB of high-frequency performance. 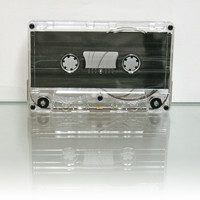 Note: Most of our cassettes are TABS OUT (check out tabsout.com for a cassette podcast) and for normal bias tape. 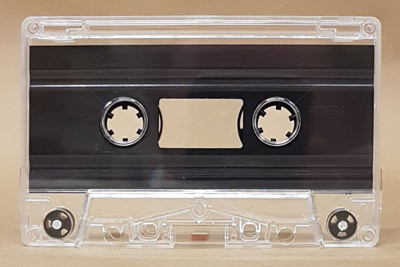 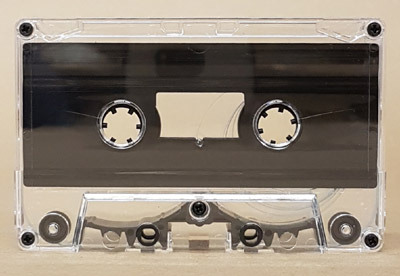 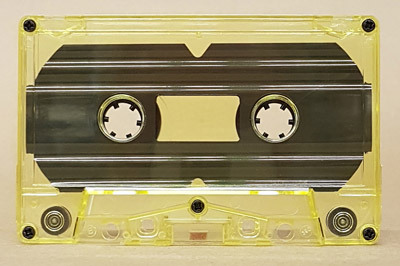 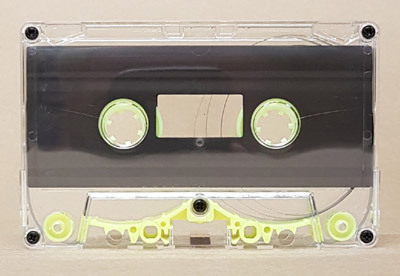 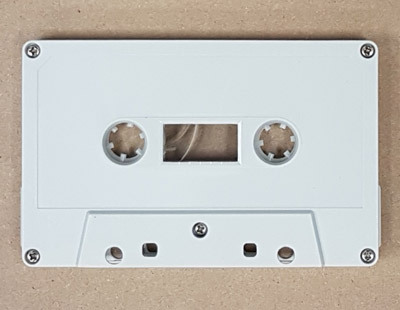 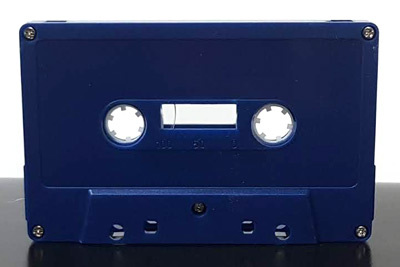 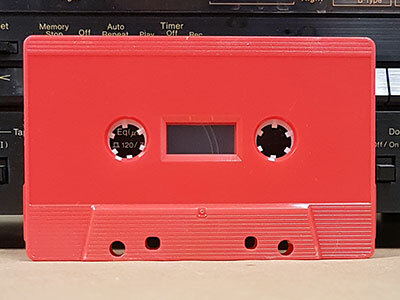 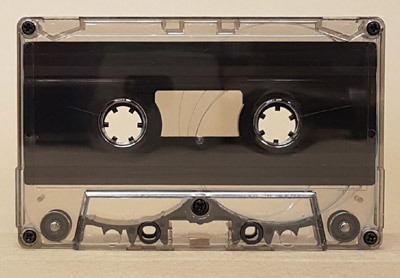 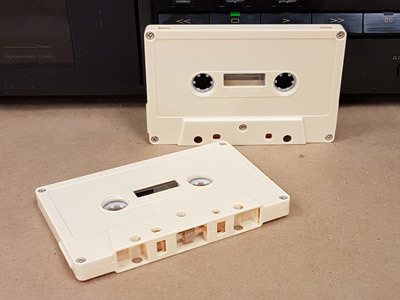 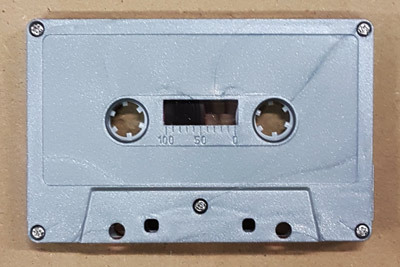 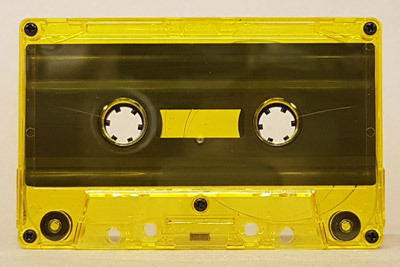 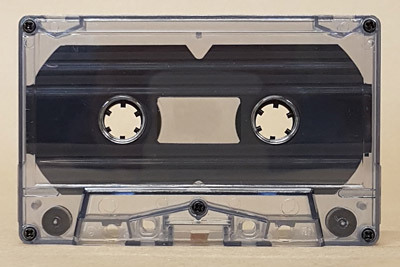 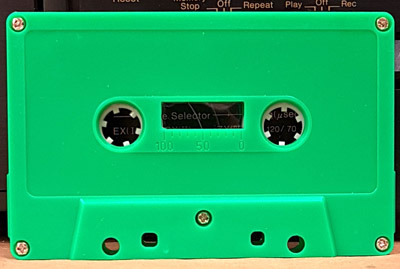 If you want to record on regular cassette decks you must put a piece of scotch tape over the record tab holes, or choose the TAB IN cassettes... or disable the record tab sensor on your machine with some duct tape or a paperclip! 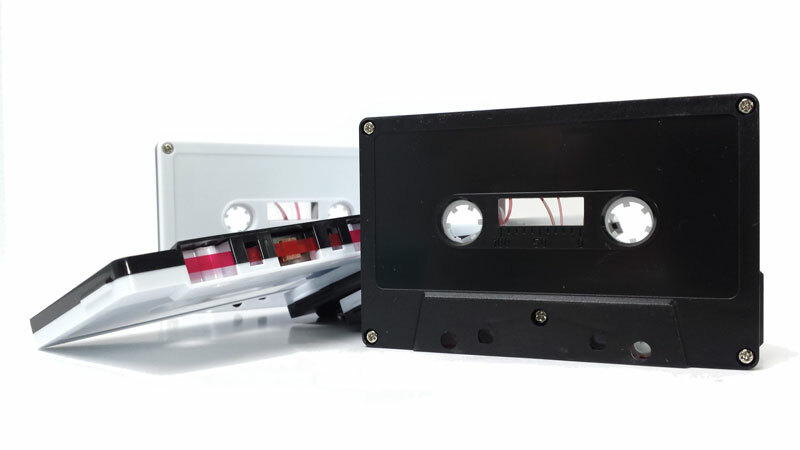 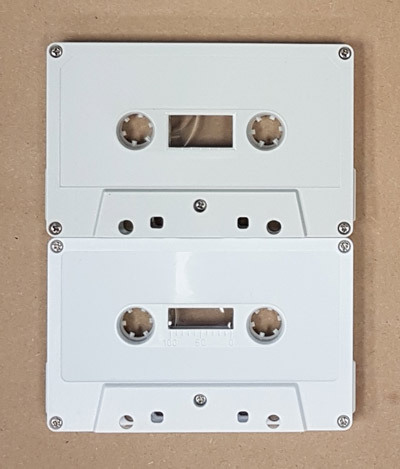 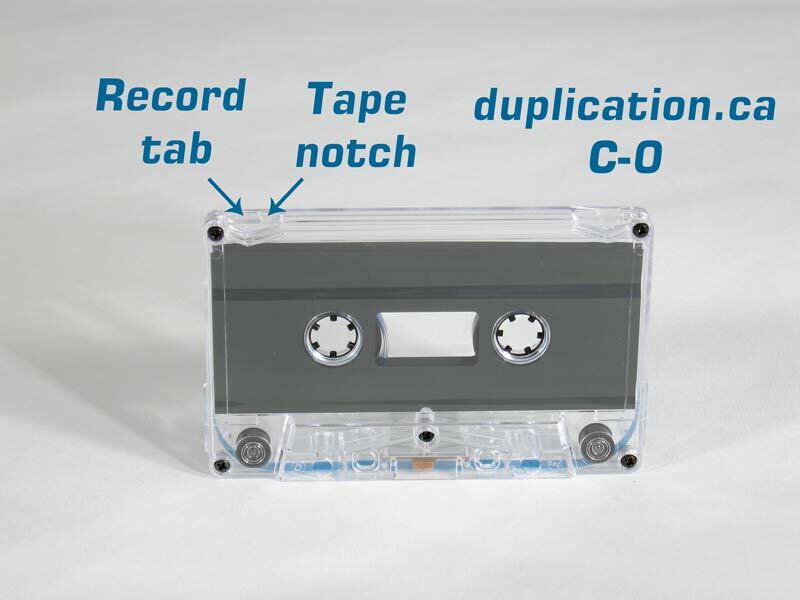 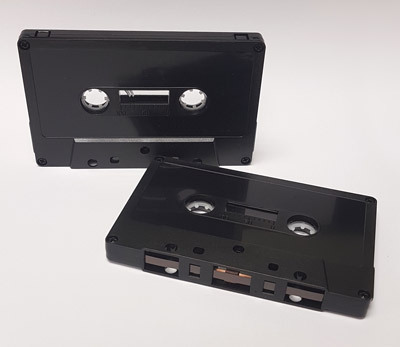 TO = Record tabs out, for duplicated cassettes or professional machines, you can record on these tapes if you put some scotch tape over the hole or if you use professional duplicators. 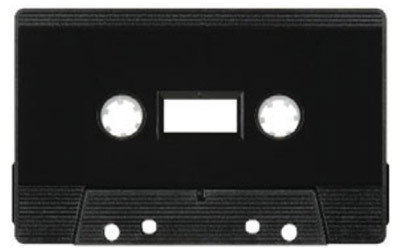 NR = Normal tape (aka Type I tape or ferro), machines record and play back with a 120 µS equalisation curve. 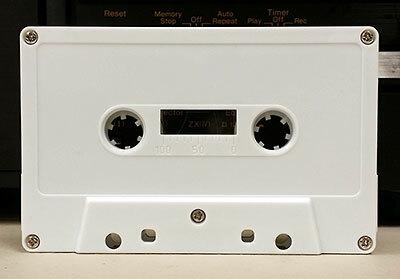 CR = for high bias tape (chrome or cobalt), has an extra notch to tell the record machine to use higher recording bias and to use 70 µS record and playback EQ. 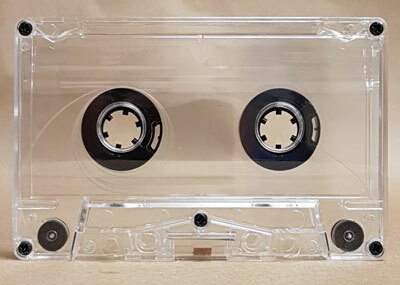 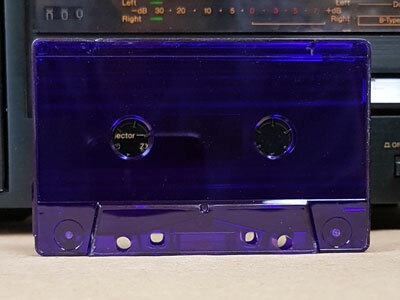 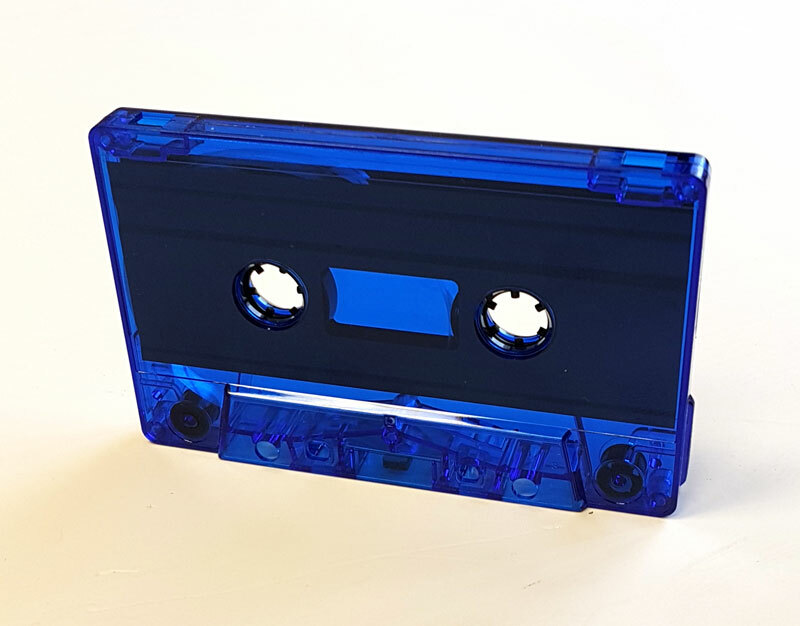 One of our tricks is to use standard normal bias cassette shells with high bias cobalt or chrome tape, and a special equalisation during recording. 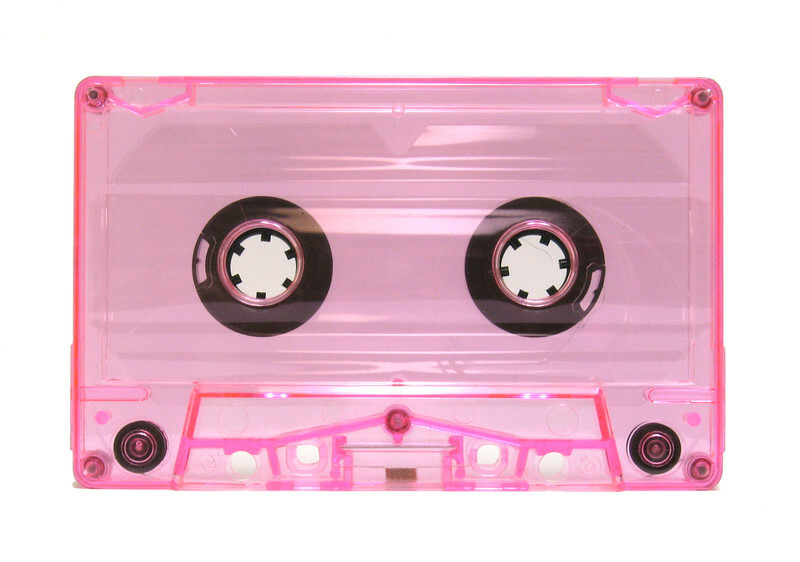 This lets us have louder and brighter cassettes. 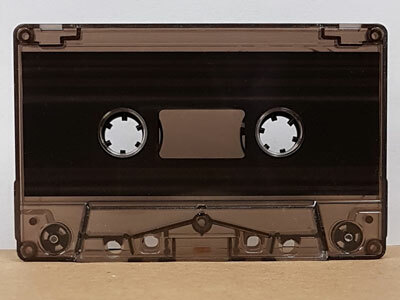 Screws: the two halves of an audio cassette shell are either held together with 5 screws, or are sonic-welded with no screws. 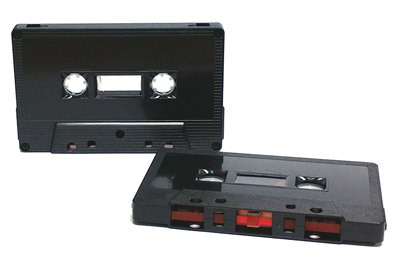 One type is not neccessarily better than the other. 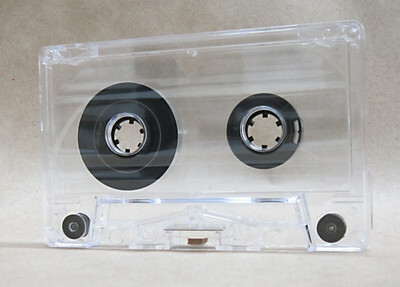 Liners: also known as slipsheets or foils, every cassette has liners to support the tape hubs. 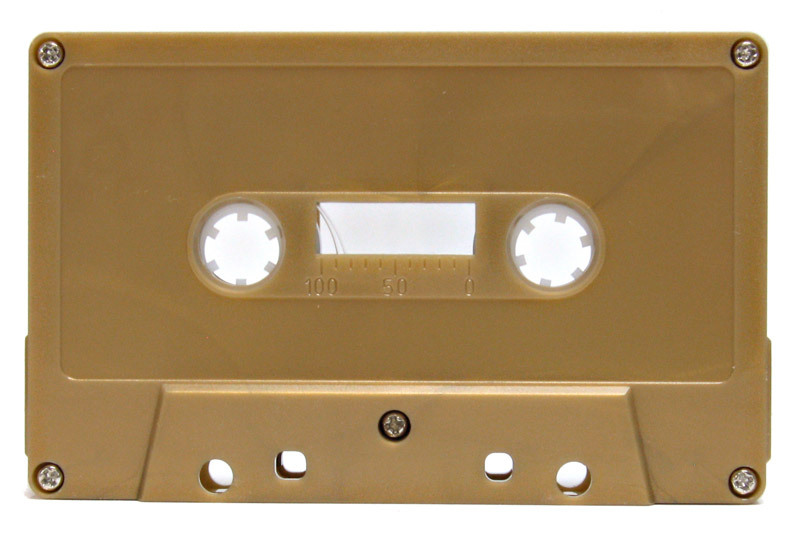 The tape liners play a critical role in permitting a smooth rotation of the tape hubs. The liners are rippled to apply a slight spring pressure on the tape hubs. 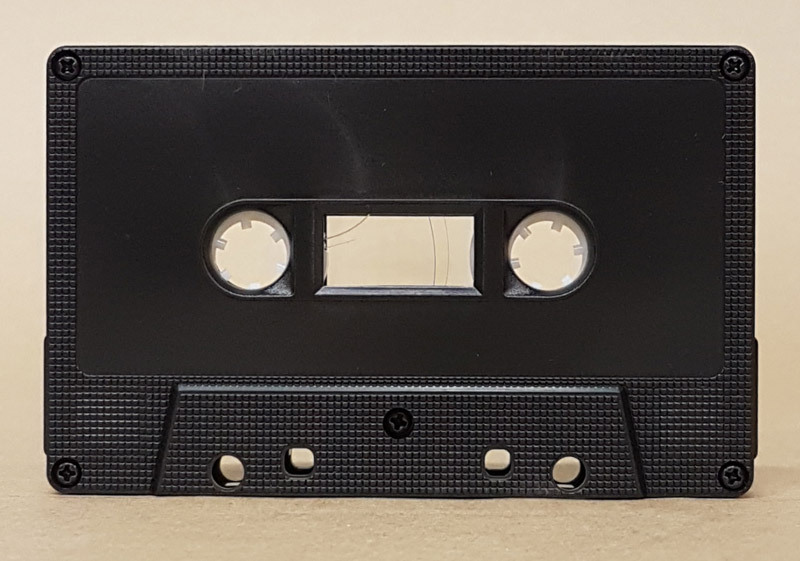 Pressure pad: The pressure pad is a wool pad mounted on a spring and applies pressure on the tape as it passes over the recording and playback head. Leader tape: every C-zero has about 15 to 20 seconds of leader tape. 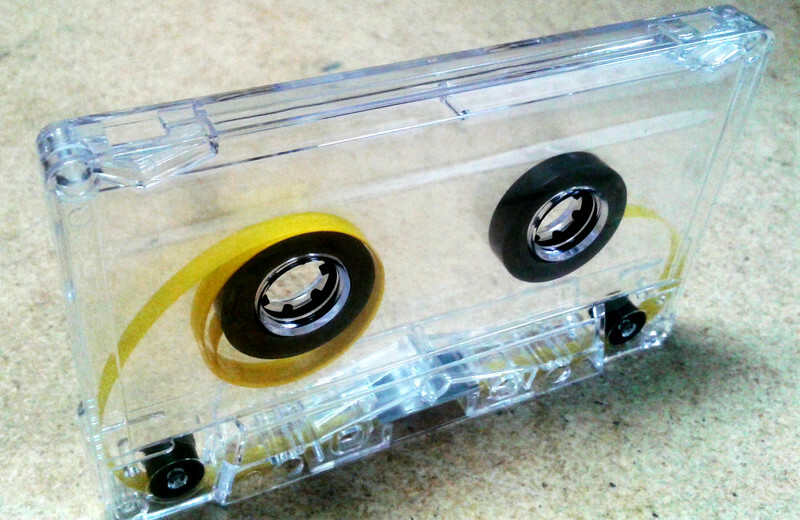 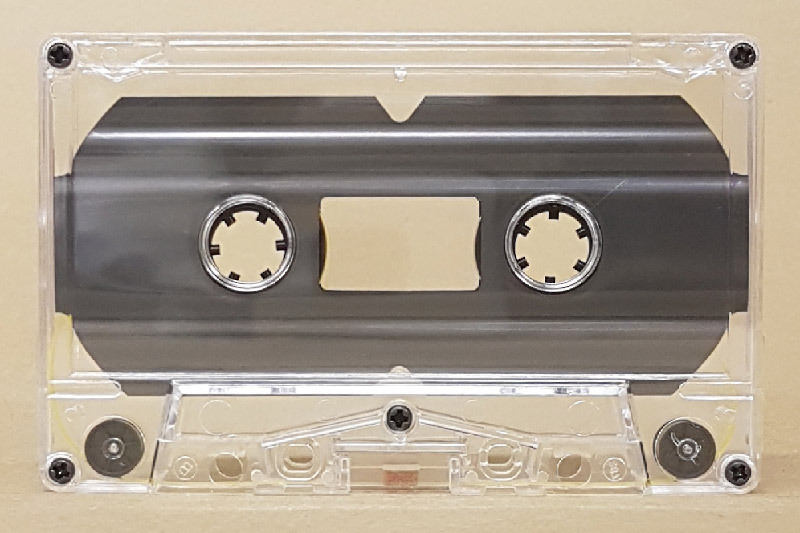 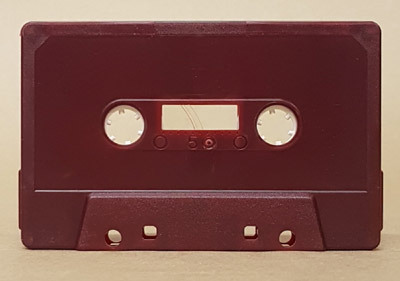 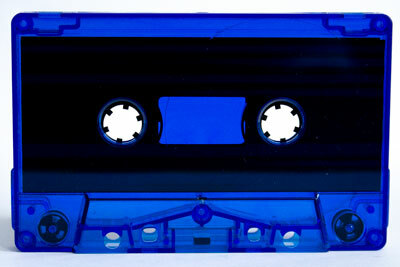 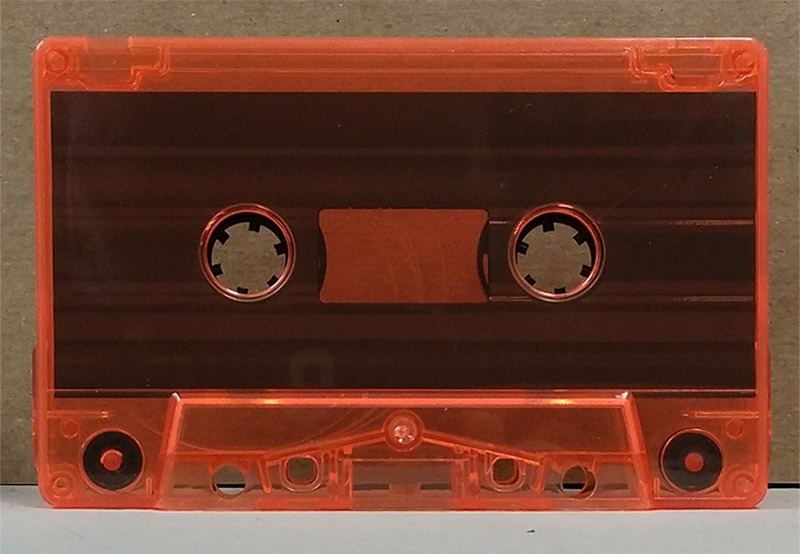 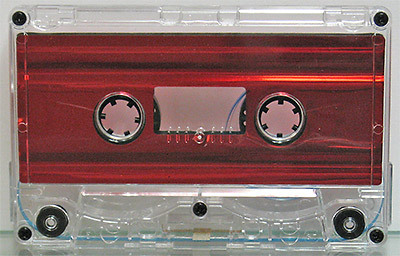 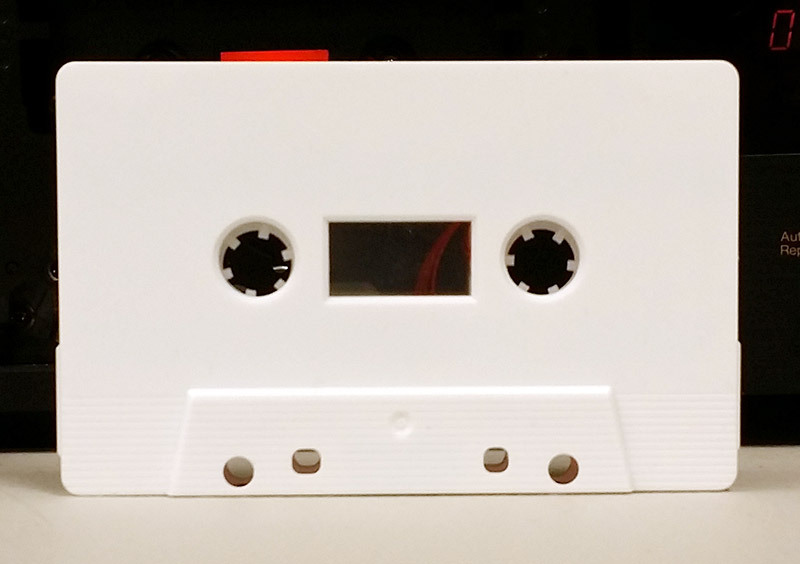 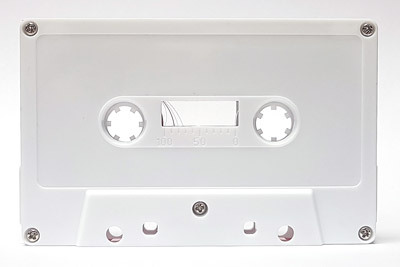 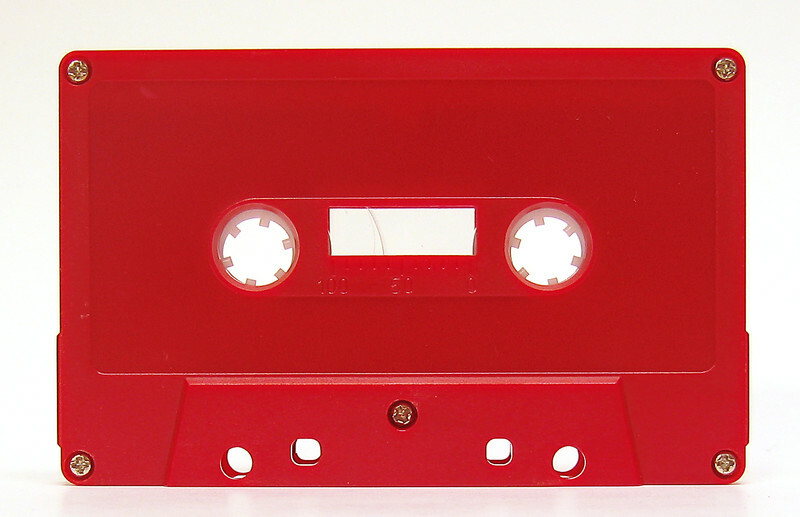 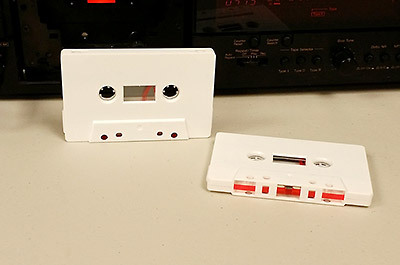 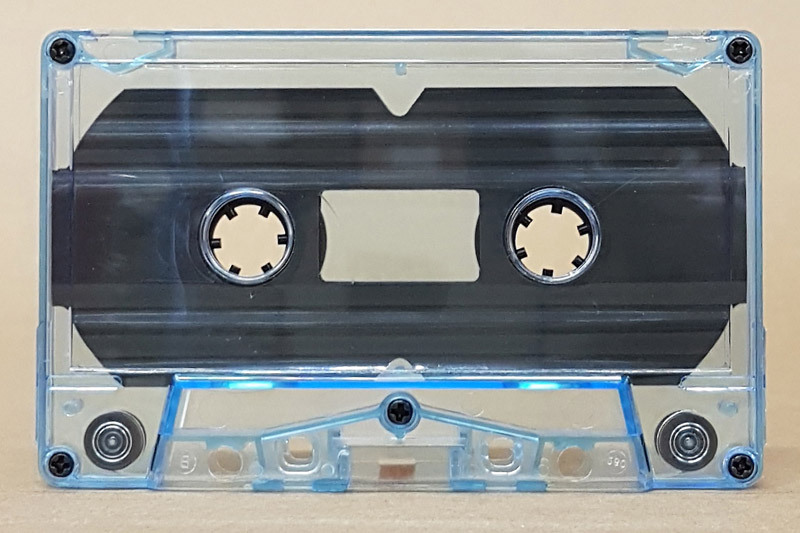 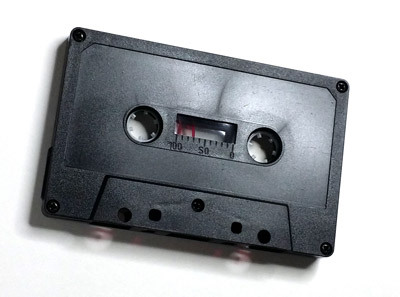 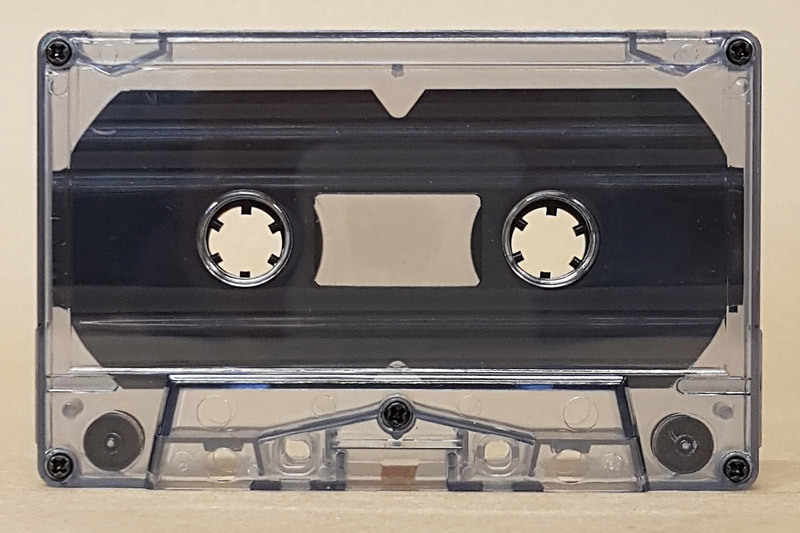 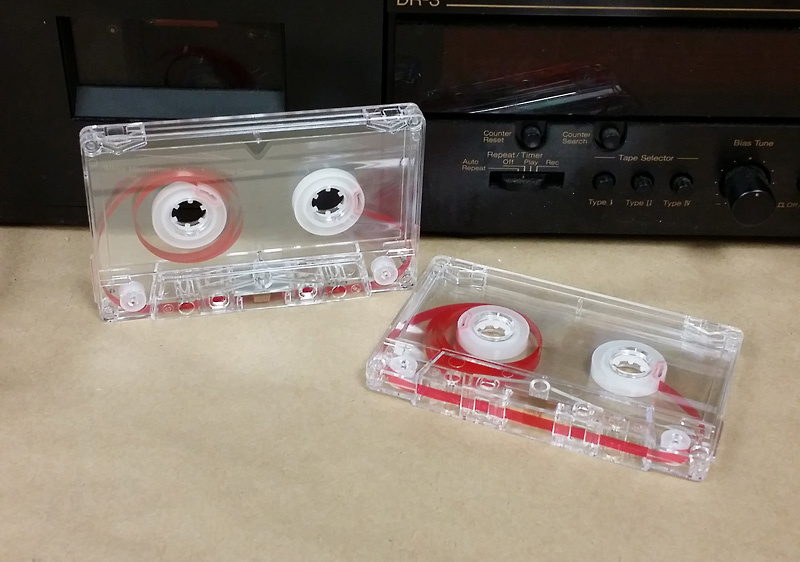 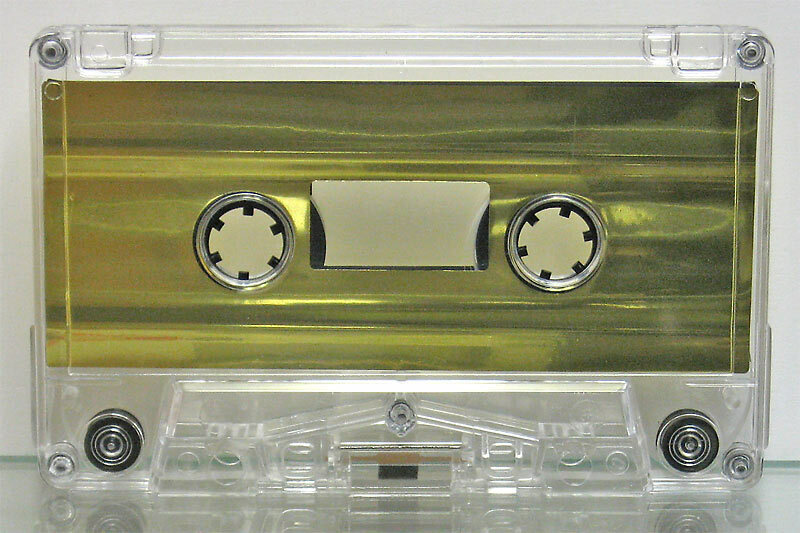 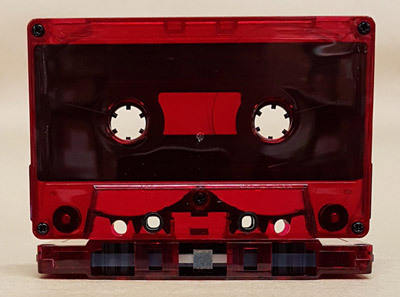 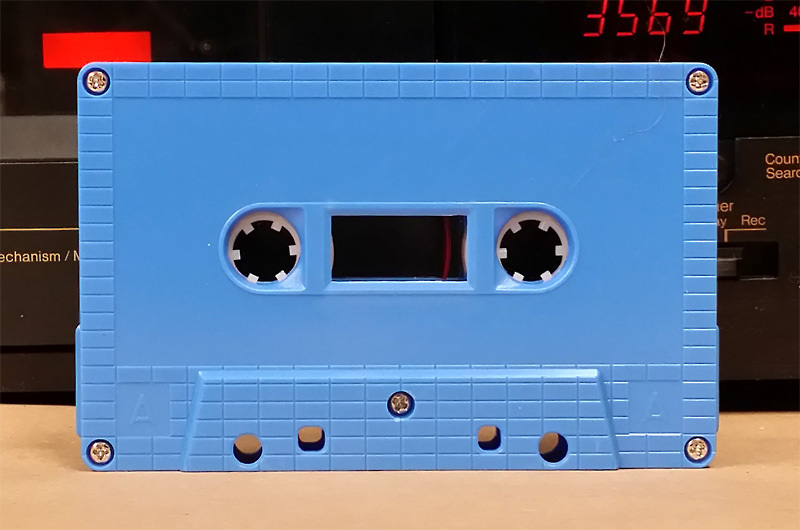 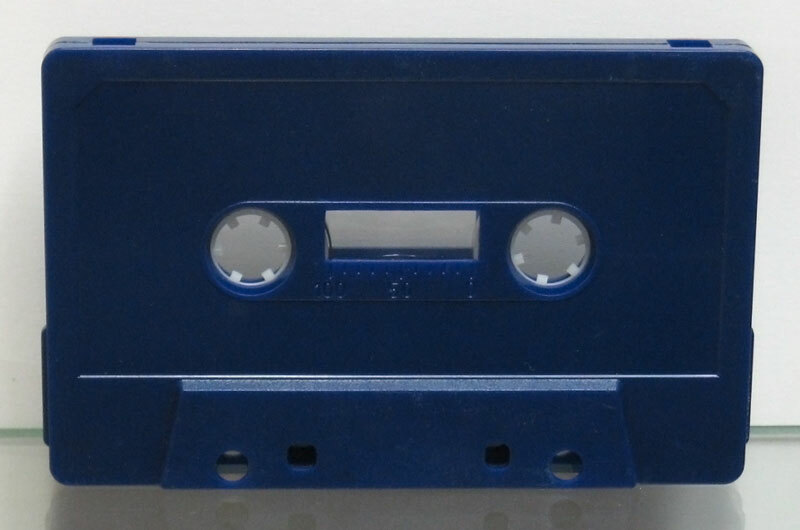 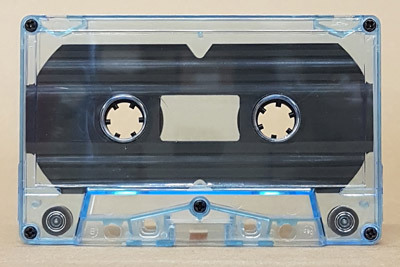 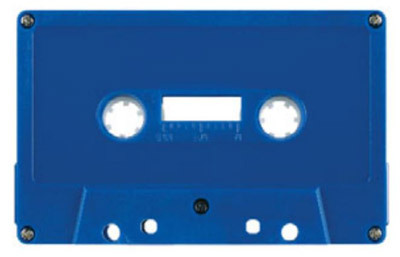 The leader tape is usually a clear, frosted, red, or blue-tinted plastic. 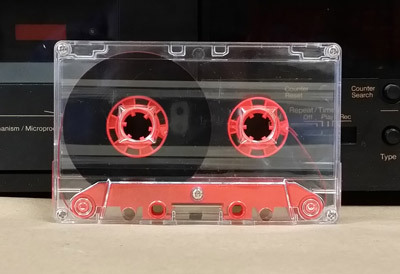 You cannot record on the leader tape. 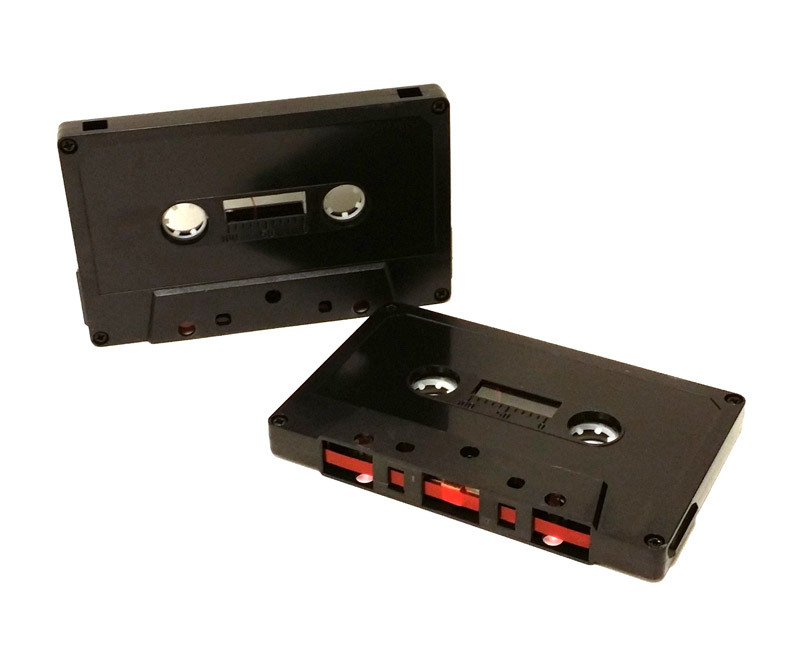 Magnetic leader: We also have cassettes loaded with magnetic leader tape to permit instant-start recording. 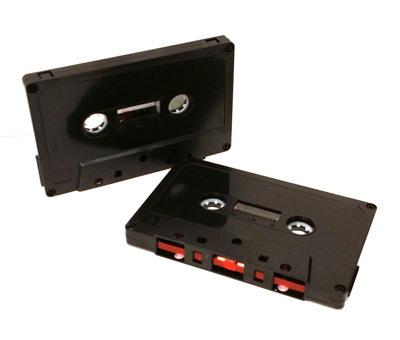 For example court reporters may want instant start cassettes so they don't miss a word. 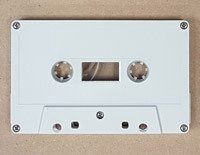 Rollers: Most C-zeros have a roller in each lower corner to guide the tape. Rollers that are out-of-round cause wow in the recording. Rollers that are not precisely made can also cause azimuth problems. Some cheap cassettes did not have rollers. 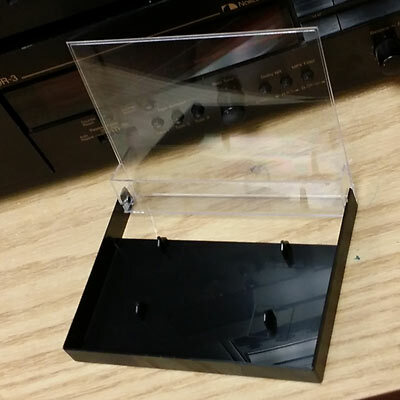 Guide posts: Most C-zeros have guide posts located before the rollers to help isolate fluctuations in the supply and takeup hubs from causing wow and flutter in the recording.